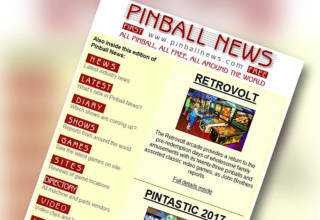 Yes, it’s time for another In-Depth Review and this time we are privileged to not only review the first game from a new pinball manufacturer, but to go to their factory to do the review. 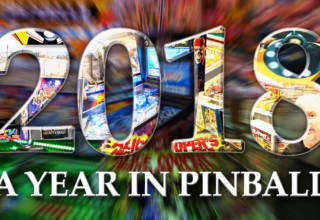 In truth we’ve been meaning to head back to Heighway Pinball in Merthyr Tydfil in South Wales ever since Christmas 2015, but trips to pinball shows and playing in tournaments meant it took until the start of April before we were able to visit. But that delay meant the software had become more polished, as indeed had the cabinet hardware as you can see in the picture of our review machine below. The review machine was a particularly special model. 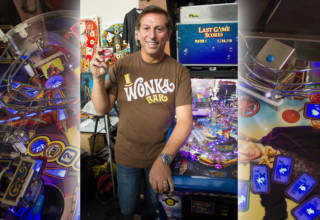 Not only was it a Limited Edition game, but it also has the optional 27-inch LCD monitor in the backbox in addition to the 10-inch playfield-mounted LCD which has been one of the trademark features of Heighway Pinball’s games. This machine also had the optional polished chrome trim package which looks quite excellent, even if its ability to pick up fingerprints and other marks means you’ll need to keep a cleaning cloth nearby at all times. We don’t believe it ships with one, but it should. The Limited Edition usually comes with a choice of two-tone colour schemes – either a red cabinet with black trim, or a black cabinet with red trim. The chrome option can be ordered to replace either the red or black trim. The trim areas are the glass magazine which incorporates the lock bar, two flipper button plates, the start button plate, the launch button plate, and the backbox sides. 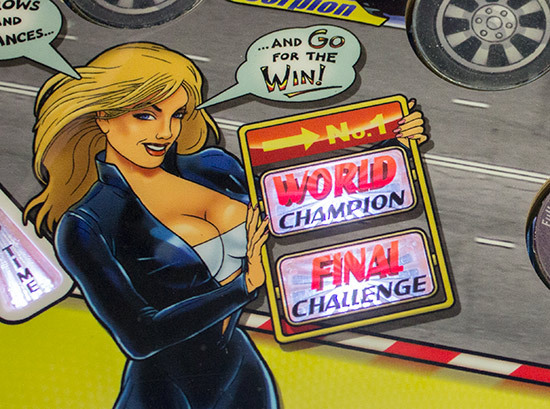 Cabinet artwork is rather limited compared to some games, with the front sporting only a small Full Throttle decal on the coin door. The shiny red cabinet outer surface is made from a set of decorative foil-wrapped MDF panels which fix onto the inner plywood carcass. That means the panels can be replaced at relatively low cost, or removed and re-coated should they ever become damaged. 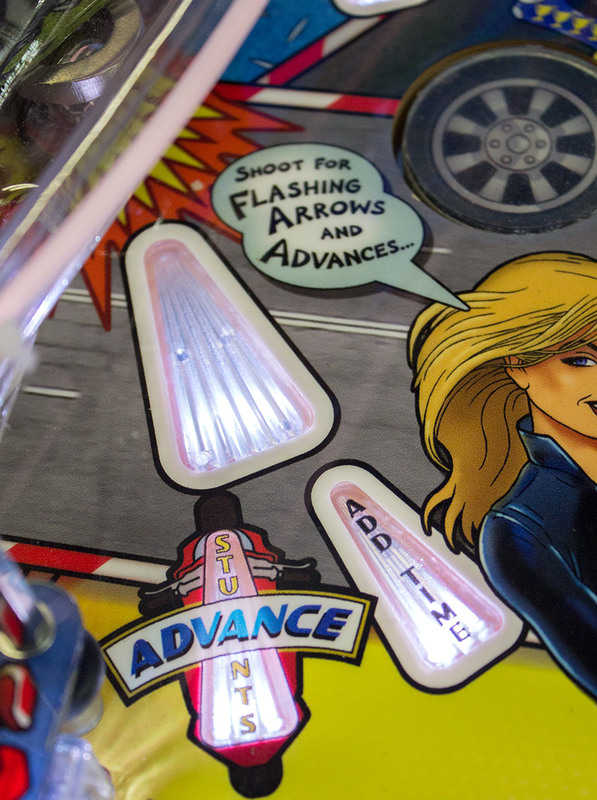 While the cabinet side art doesn’t cover the whole side of the game, the Heighway Pinball Gamechange System means the cabinet and backbox artwork can be easily changed to another title, or to a custom graphic if you prefer. 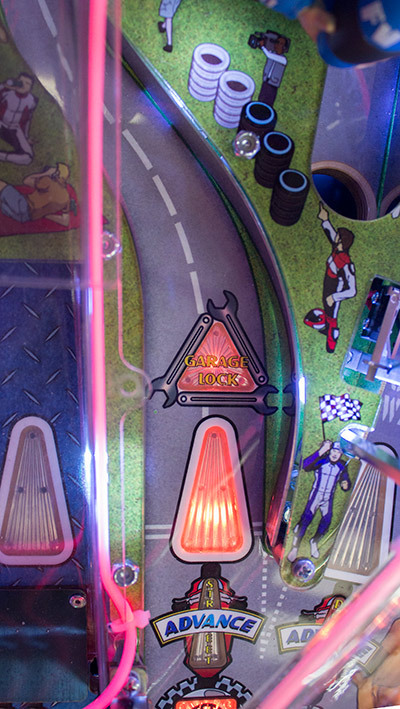 That cabinet side artwork is illuminated by a strip of LEDs at the base, making the game stand out in a darkened games room. The design of the artwork is the same on both sides. So let’s move up to the backbox, and the chrome treatment extends to here too. 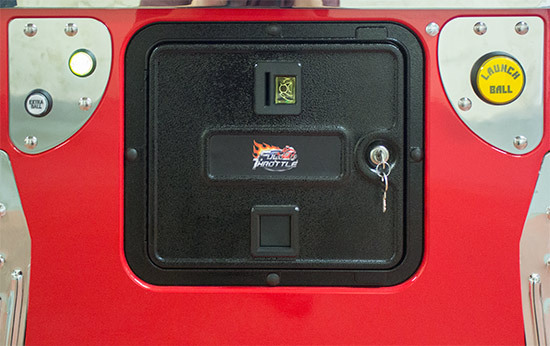 The backbox has a hinged front which can be opened by releasing the two key locks on the right side of the backbox. If you have the chrome trim you would want to make sure the keys don’t scratch it, and that you don’t fumble around in the dark trying to find the keyhole. 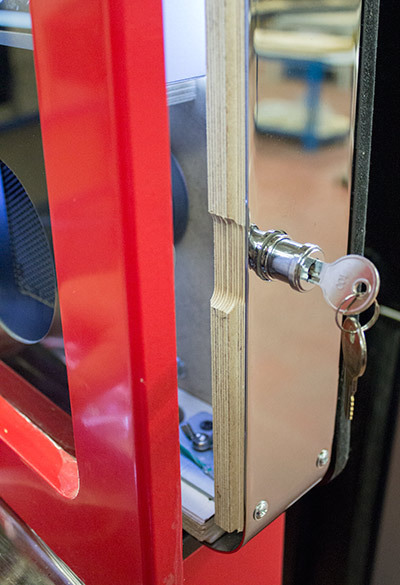 Turning the key causes the lock mechanism to pop out, disengaging a pin from the backbox latch. Release them both and the door can swing open. Interestingly you can close the locks without the keys as long as they have been left in the correct position; you just push them in and they re-lock. Just don’t lock the keys inside! The backbox frame is constructed from plywood, held together by metal brackets on the inside and surrounded by metal trim pieces on the outside. 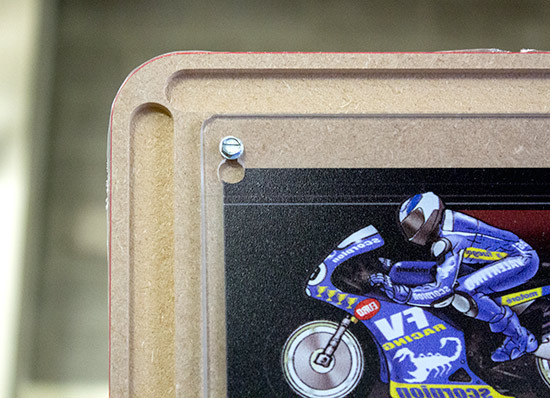 The front is another piece of foil-wrapped MDF. Because this machine has the 27-inch LCD display there is reduced artwork on the backbox’s front panel, with a large clear area to show the display’s imagery. 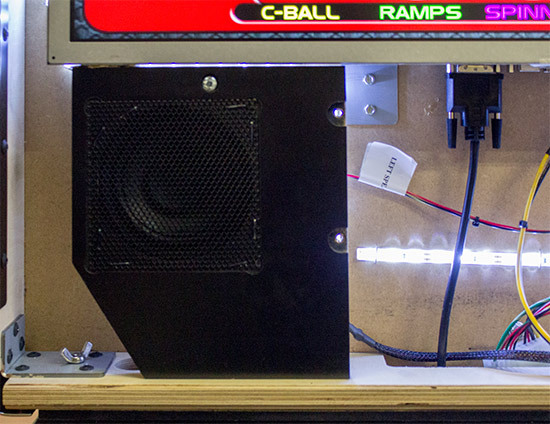 The front panel is backlit by strips of white LEDs stapled onto the rear panel. 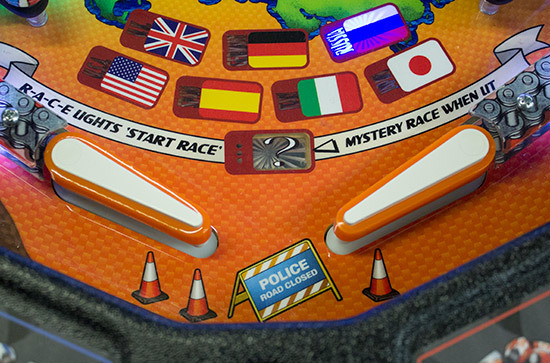 When changing games, the backbox’s front panel also needs to be changed. Ten screws fix the panel to the front door, and these can be loosened so the panel can be lifted up and removed. Inside the backbox we have the LCD monitor, two speaker enclosures, and the LED strips. The monitor is a commercial-grade one, with a metal case and mounting brackets top and bottom. It has to be said that the image quality is great on the monitor, with good black levels which is an important feature when the design of the graphics contains large areas of black. There are two backbox speakers and one cabinet speaker. The sound is stereo, so the left and right speakers are identical general purpose full-range devices. 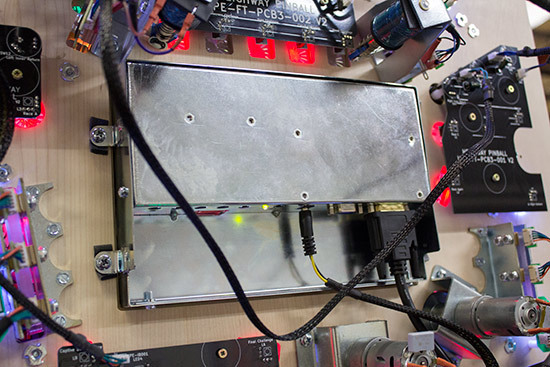 Without any of the control system in the backbox, there are only a few connections between it and the cabinet. 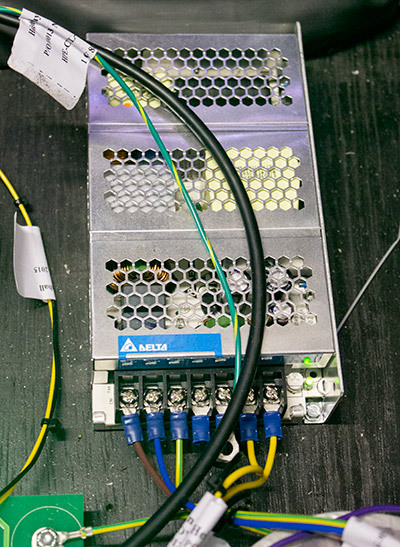 These are the left and right speaker feeds, power for the LED strips, power for the monitor, a ground wire, and the monitor’s video signal. All but the last of these are combined into a multi-way connector, while the monitor’s video feed is a separate standard HDMI cable. So that’s what’s in the backbox. Now let’s move down to the cabinet and see where the power and electronics live. Opening the coin door reveals a familiar bank of four menu buttons, and indeed they work in exactly the way you would expect. The black button is ‘select’, green is ‘back’, while the two red buttons are ‘-/down’ and ‘+/up’. 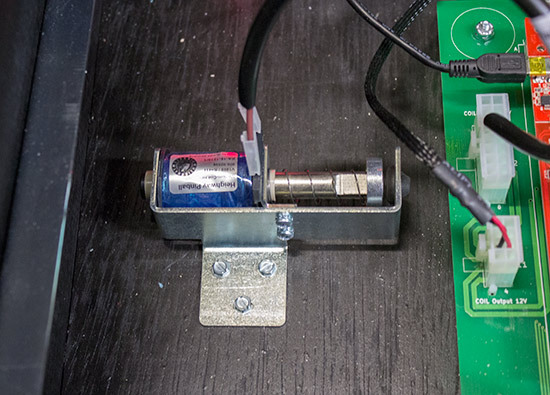 Happily there is a connector for the button bank, so if you ever need to replace a failed button you can take the whole module to somewhere more convenient and work on it there (or swap the module with a working spare). 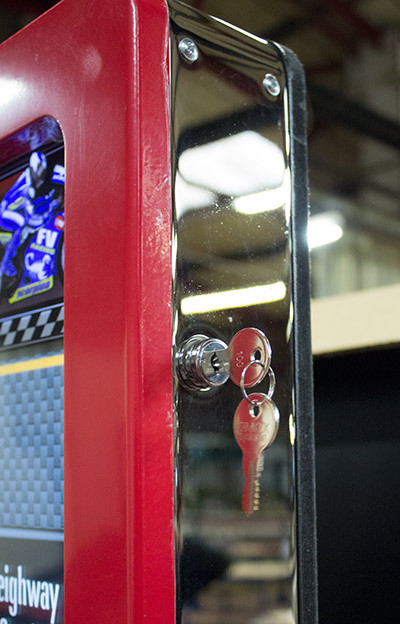 The cables are protected by plastic spiral wrap in the key area where they can become pinched when the door closes. 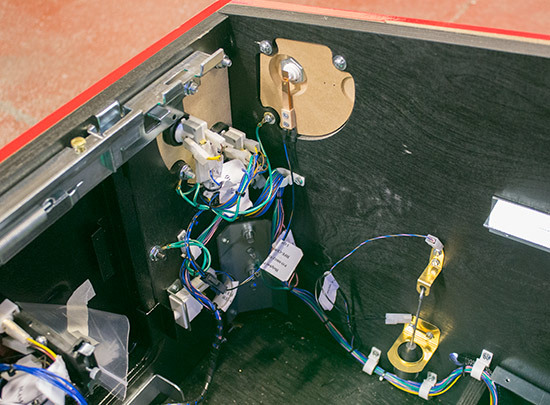 The rest of the coin door is pretty standard and will vary slightly depending on the region of use, with one or more coin mech positions available. This is a European door, so it has one coin mech position and no bill acceptor cutout. To find out more about what’s in the cabinet we’re going to have to remove the glass and lift the playfield. The glass is held in the metal ‘magazine’ frame which provides the side rails and lock bar. This magazine is secured at the front with the familiar lock bar mechanism as used on Williams/Bally and earlier Stern titles. Slide the lever to the left and lift up the front of the magazine. 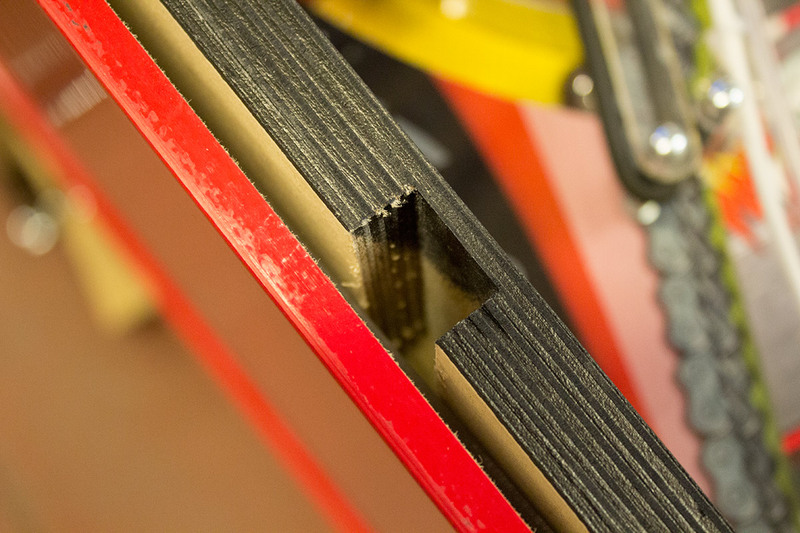 At this point you need to decide whether you just want to raise the glass magazine to give access to the playfield for a quick fix or adjustment, or whether you want to remove it entirely. If you are removing the magazine entirely you need to make sure you don’t put it down so you damage the decorative finish, which means keeping the lock bar end at the top. Once the glass magazine is removed, we can slide out and raise the playfield. 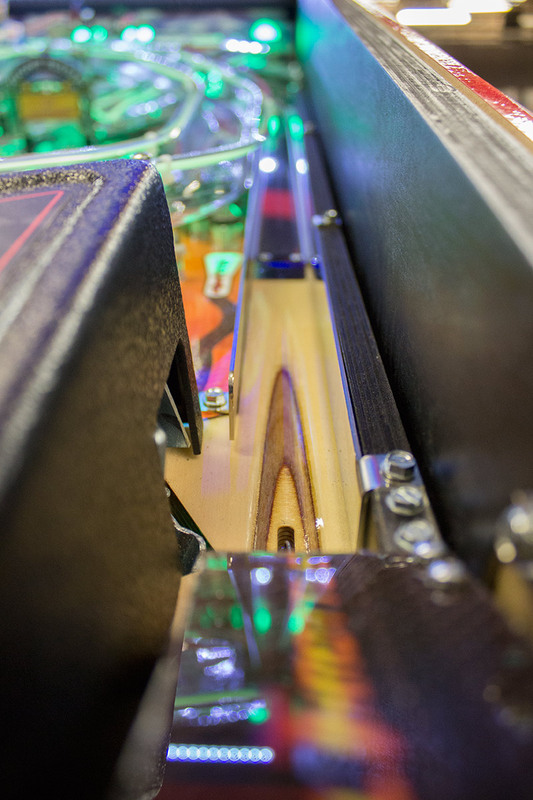 This is done in the usual way – putting your hand under the apron, lifting the front of the playfield up, and sliding it forward onto the slide rails. 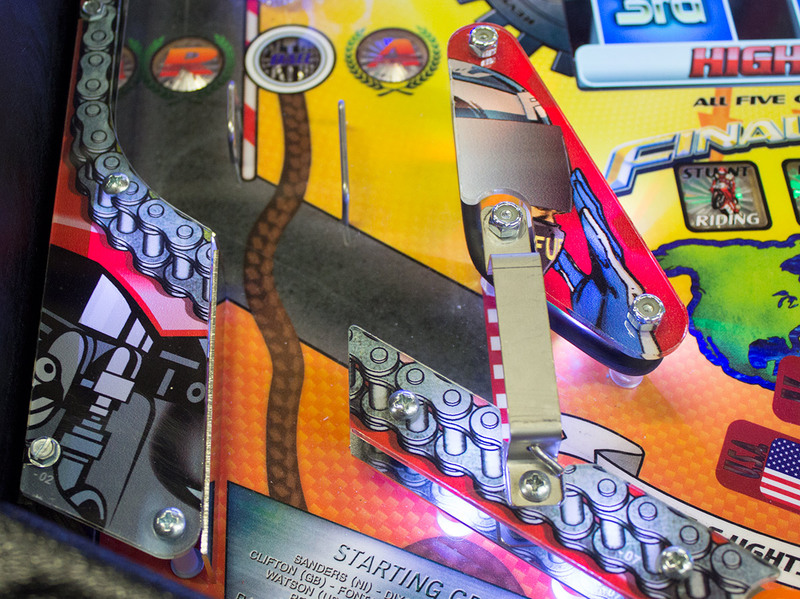 Although Full Throttle uses a plastic front apron in all models, there is a reassuringly solid metal bracket at the point where you lift the playfield so you don’t feel you’re about to rip the apron off or snap it in two. 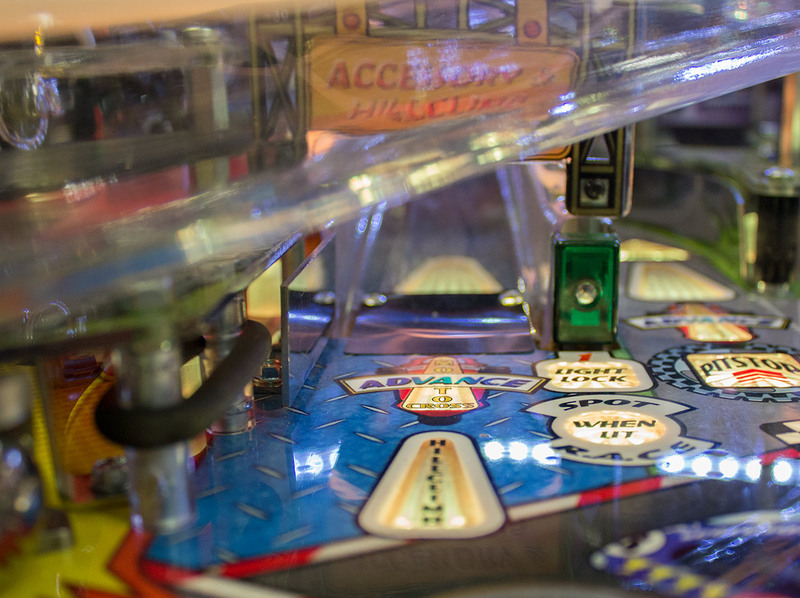 Sadly, when you do raise the playfield toward the vertical position you discover there’s no little tab or other device which stops all the balls falling out. 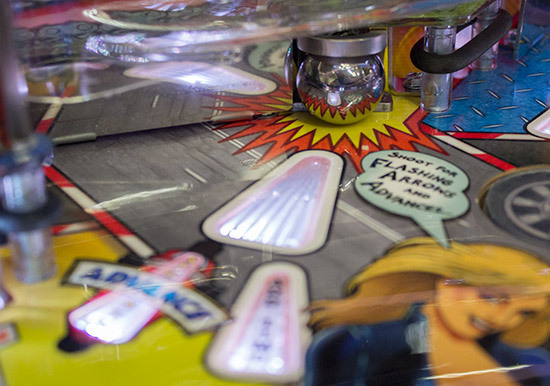 So you do need to remove the balls first or risk damage to the playfield plastics and mechanisms. 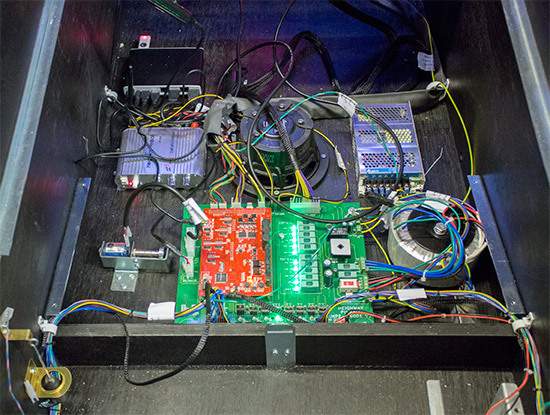 Inside we find two power supplies – one a switching supply and the other a toroidal transformer – a power amplifier, a bass speaker, a power board with an input/output board attached, and a small-form-factor PC. 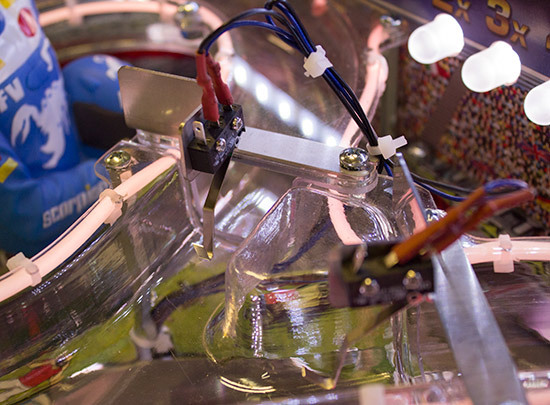 For the coils, the toroidal transformer provides a powerful 70V supply capable of reacting to rapid changes in current draw when solenoids fire. While the switching power supply can handle input voltages of 100V to 240V and so is suitable for use around the world, the transformer’s primary winding voltage needs to be manually switched between 115V and 230V depending on where the game is to be used. There is a switch on the power board to accomplish this. 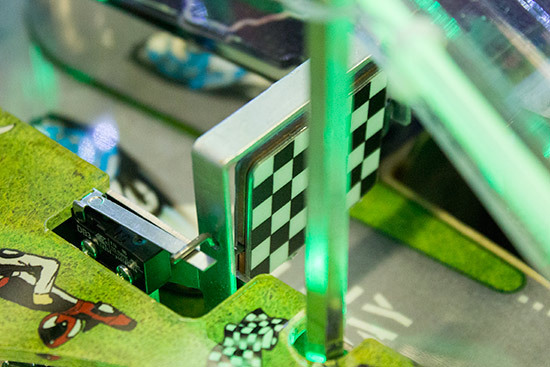 The whole game is driven by a small-form-factor (SFF) PC located in the base of the cabinet. 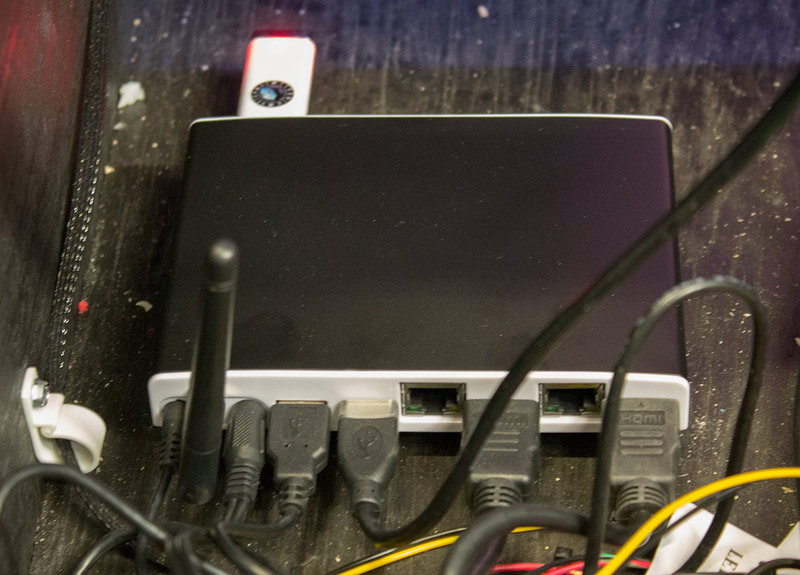 This tiny unit connects to the game’s circuit boards over USB, runs the game code from a USB memory stick, provides two (mirrored) HDMI outputs for the two monitors and gives a stereo audio output. It also features Ethernet and Wi-Fi network connectivity, although these are not currently utilised. The USB port which connects to the playfield first goes through a small passive USB hub mounted under the playfield to expand the number of connections. 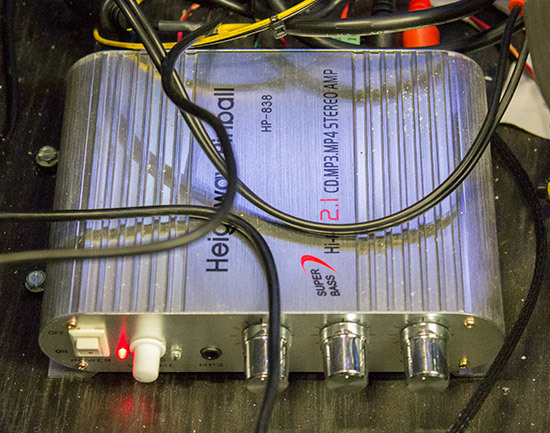 The stereo audio output from the PC is fed into a car power amplifier which then drives the game’s three speakers. The stereo outputs head off to the backbox, while the separate bass feed goes to the adjacent Lanzar Max Pro 6.5-inch subwoofer. The largest component in the cabinet base is the power board. This is actually two boards in one. 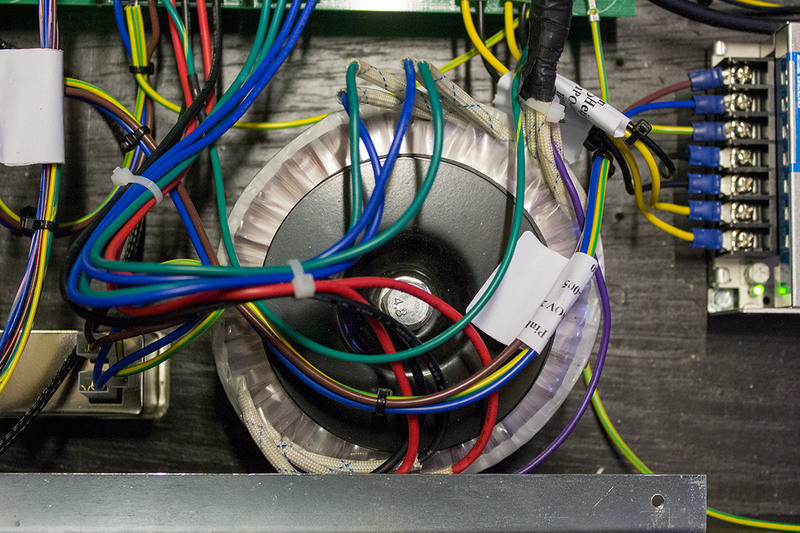 The green PCB distributes the 12V and 70V supplies around the machine, while providing fuse protection and LED indication of the supplies’ health. 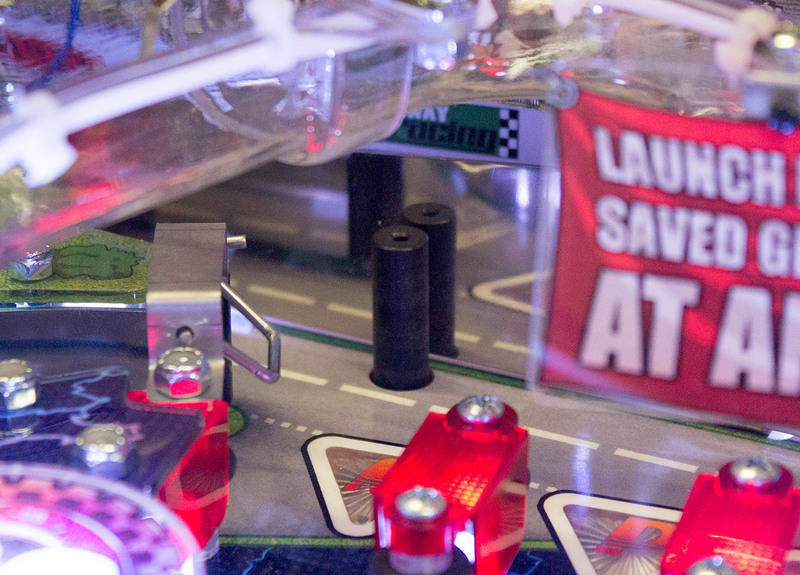 It also drives the LEDs in the launch and start buttons, and the game’s knocker. These drivers are under control of the brown input/output (I/O) board. 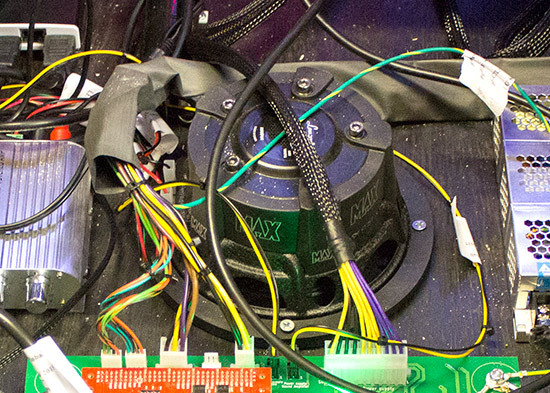 There are four of these in the machine connected to the PC via USB, with the other three mounted under the playfield (although these playfield mounted I/O boards are coloured green). The I/O boards do what their name suggests, handling the outputs to coils and LEDs, while relaying switch inputs back to the PC. The tilt bob is a conventional brass one located in the usual place, but the flipper button and start button switches do bear closer examination. Although this review game uses leaf switches for the flipper buttons, we are told that future games will use opto switches instead. We talked earlier about how the cabinet and backbox art can be swapped for future games, but this extends to the cabinet hardware too. 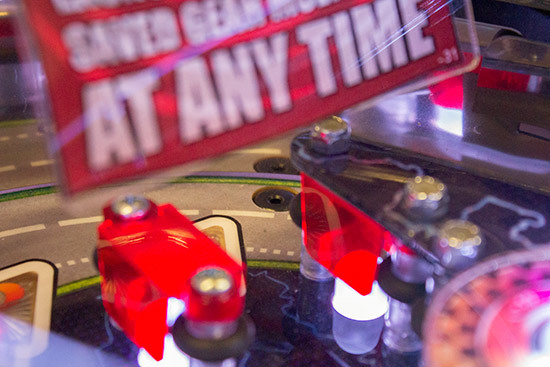 If a future game requires extra flipper buttons, multi-stage flipper switches, or other control surfaces, the flipper button plates can be removed and replaced, as can the start button and launch button plates. 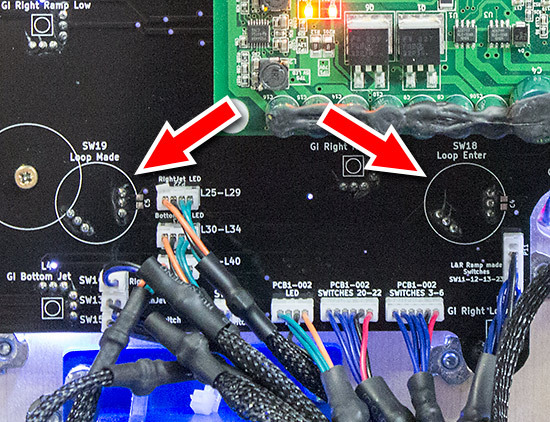 If the new controls require illumination (or even force feedback), there are spare drivers on the power board to supply them. One big concern we had was about that happens when a screw, nut, washer or other piece of metallic playfield hardware drops from the playfield. This probably wouldn’t happen when the game is new, but over time these things work loose, or can be dropped by a technician working on the game. 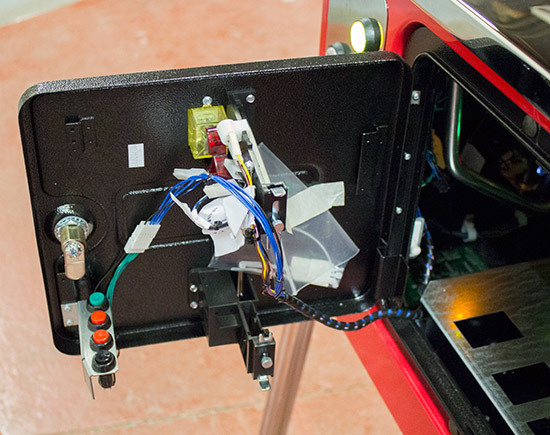 However it turned out that this particular review machine was missing a protective plastic cover which is normally fitted to production machines for just this reason. So that’s what we find inside the cabinet. 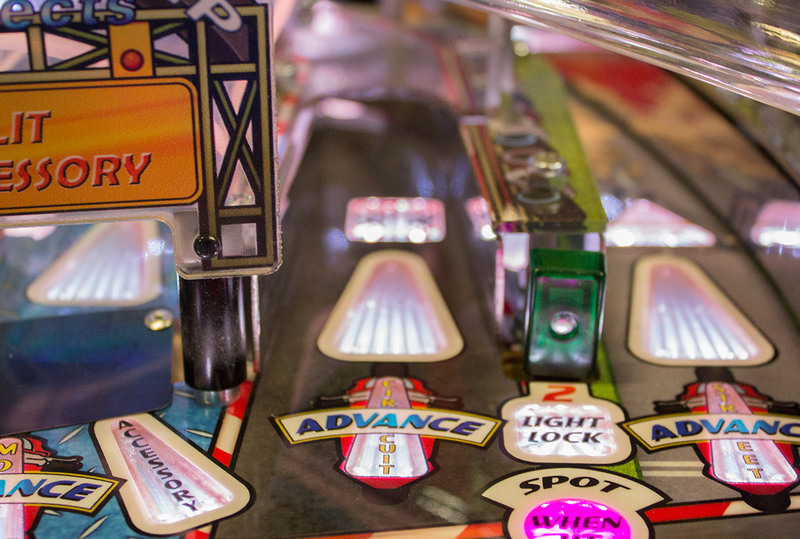 Now it’s time to move onto the playfield. 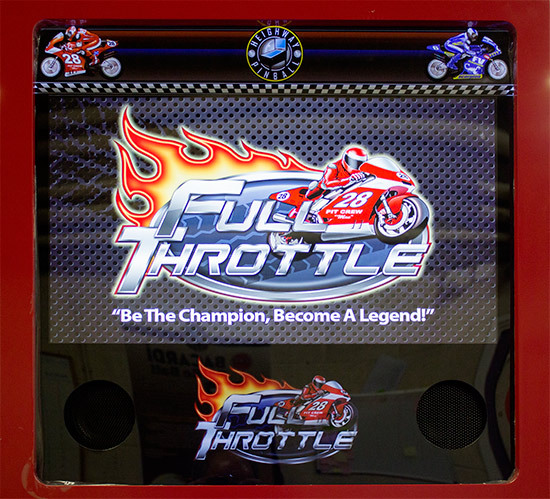 Full Throttle is a two-flippered wide-body game, featuring two ramps, four spinning wheel discs, a rotating Francisco Valentino model, and an inset 10-inch LCD monitor. 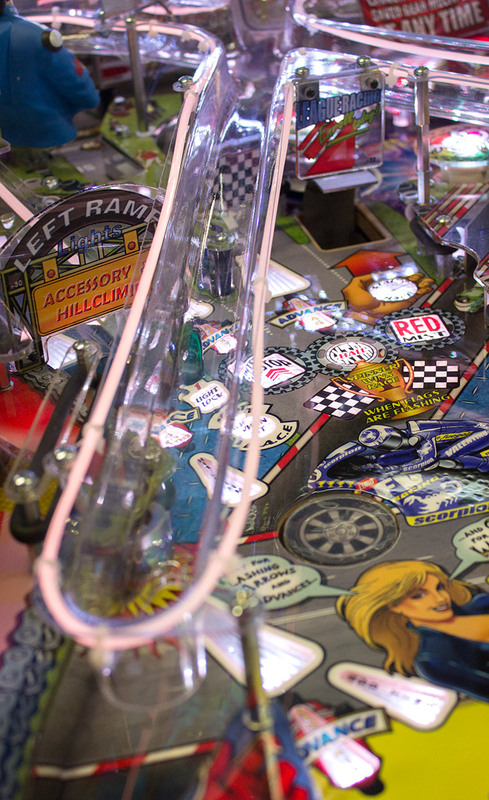 Although it was originally designed with a different theme and as a narrow-body game, designer Dave Sanders has expanded the lower half of the playfield while keeping the speed and flow of the original layout. 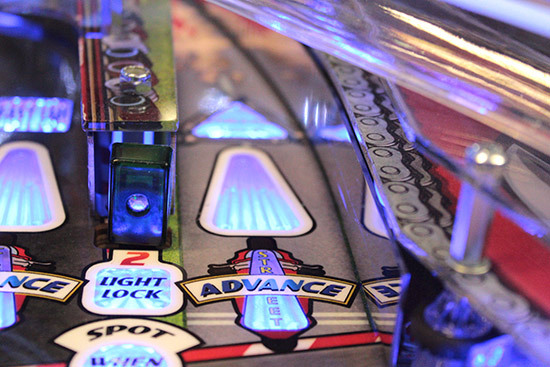 Being a Limited Edition model, this game has RGB fibre-optic light pipes around the ramps which help with their definition and can illuminate in just about any colour during game play and attract mode. As usual in these reviews we’ll start down at the flippers and work clockwise around the playfield, showing you all the shots, features and mechanisms as we go. 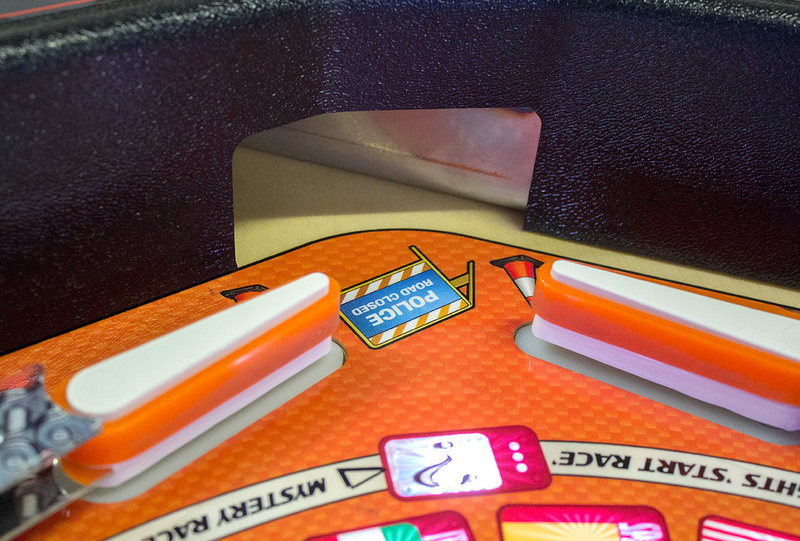 The two flippers are standard 3-inch length and fitted with orange polyurethane ‘rubbers’. The unusual part about the flippers is the white plastic base upon which they sit. 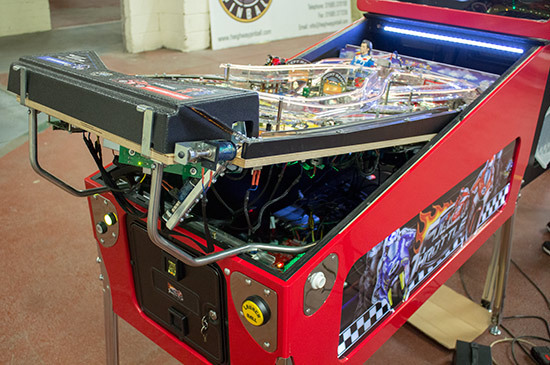 This is part of the modular approach used in Heighway Pinball games where key components can be unbolted and removed if they need servicing, rather than having to be worked on in-situ. 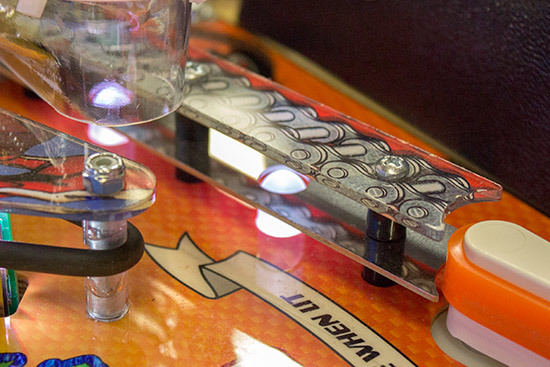 The flippers are part of this philosophy, and so their mounting plates can each be unbolted, the coil and end-of-stroke switch unplugged from the nearby I/O board, and the whole assembly dropped out of the playfield without needing to disassemble the flippers. This same concept applies to the pop bumpers and the slingshots, meaning a technician could carry spares which can be quickly swapped in while the original part is taken away for servicing. Other than that difference, the flippers play as you would expect without any obvious degradation after long periods of play. 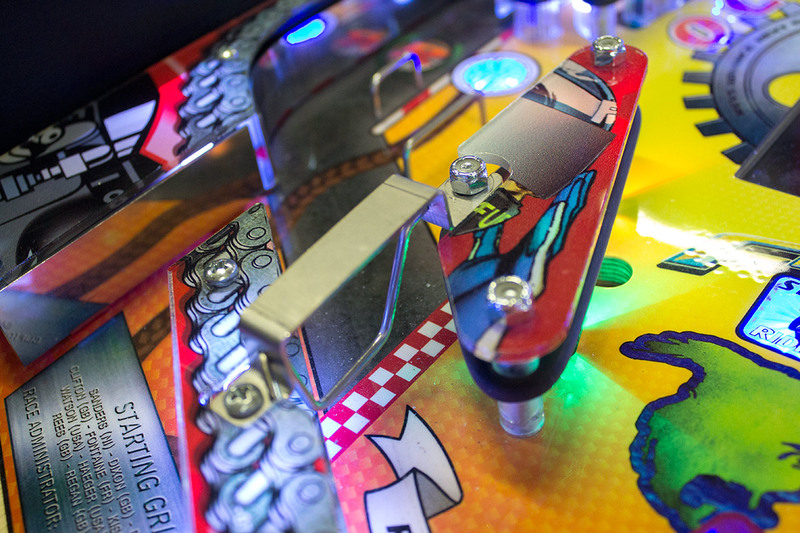 Despite the similar colours of the flipper ‘rubbers’ and the playfield artwork, their light colour and white base plate helps with their definition in darker environments. In one direction at least, the left inlane ball guide is somewhat shorter than we might expect due to unusual inlane/outlane arrangement. To see why this is, let’s look at those inlanes and the outlane. 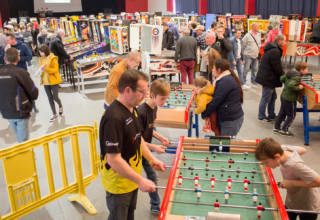 There are three lanes in total, with the inner and outer lanes adding a letter to R-A-C-E which qualifies the next race, and the centre lane awarding an extra ball when lit. 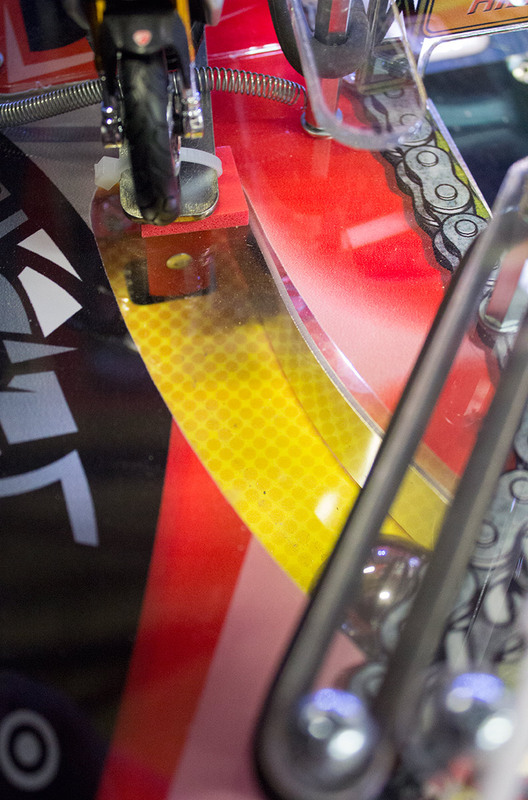 The outer lane feeds smoothly to the left flipper without any brake to slow down the ball. The inner lane also feeds to the flipper, but the ball hits the guide first, killing any momentum and giving a much more controllable feed. Be careful though, as a nasty spin or unkind bounce can result in the ball missing its mark and falling into the gap to the left. The middle lane is the true outlane, and there’s little opportunity to prevent the ball draining once it starts down this lane with no rubber rings or posts off which you can bounce the ball. 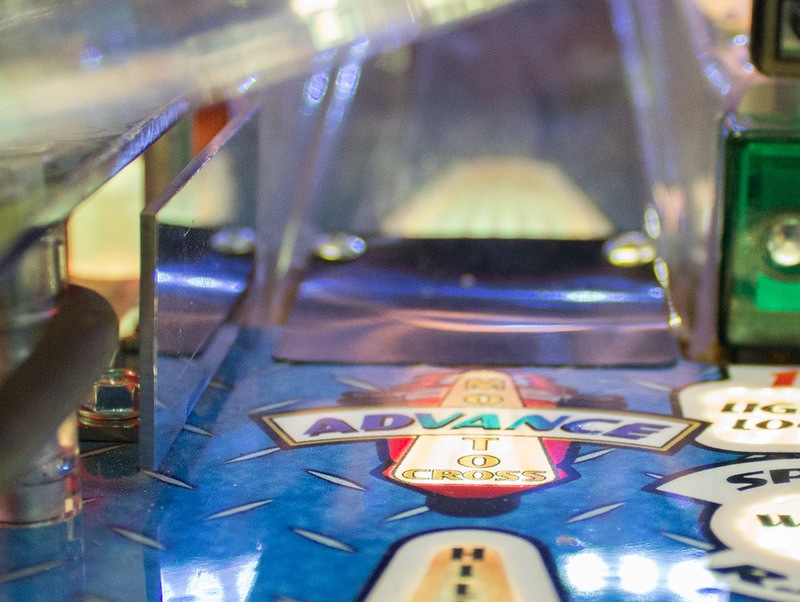 However, the game is quite kind by providing a one-way gate in the feed to the flipper to prevent a trapped ball rolling up the lane and falling into the outlane gap. Owners wanting to toughen-up their games or tournament directors looking to cut ball times could remove this gate to provide an extra challenge. 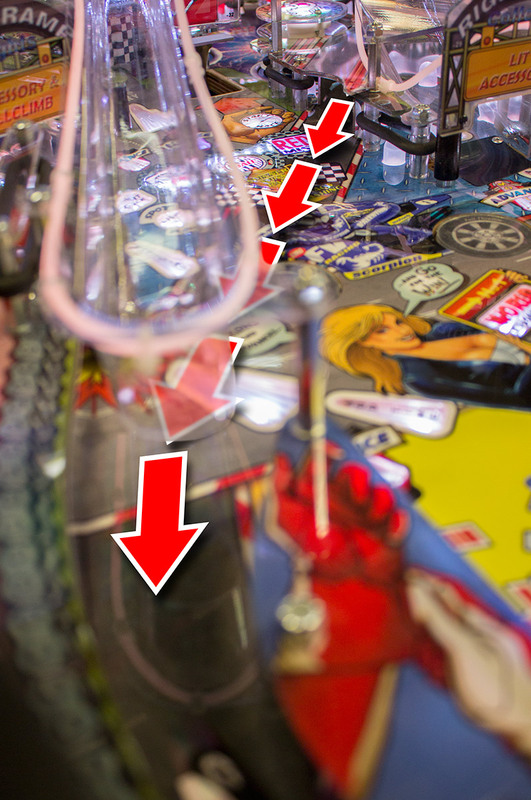 One thing you might have noticed from the pictures above is the absence of any rollover switches in any of the lanes. 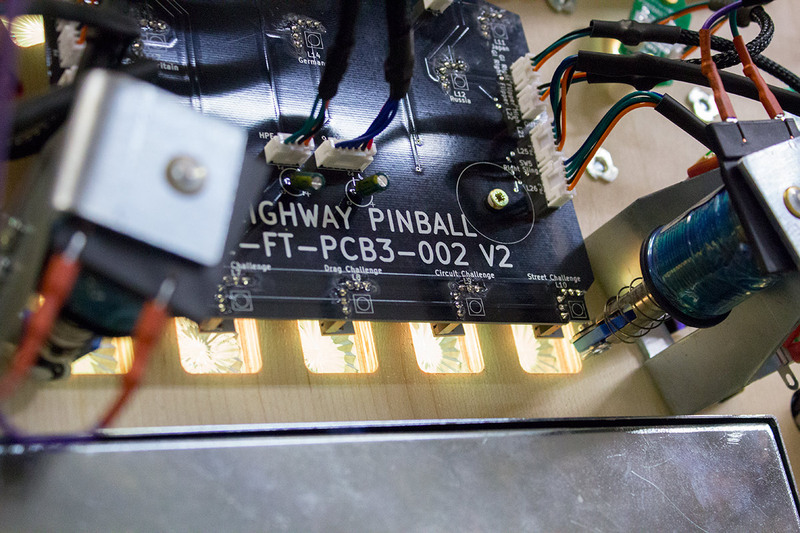 That’s because Heighway Pinball mostly uses self-adjusting inductive sensors under the playfield to detect the ball. 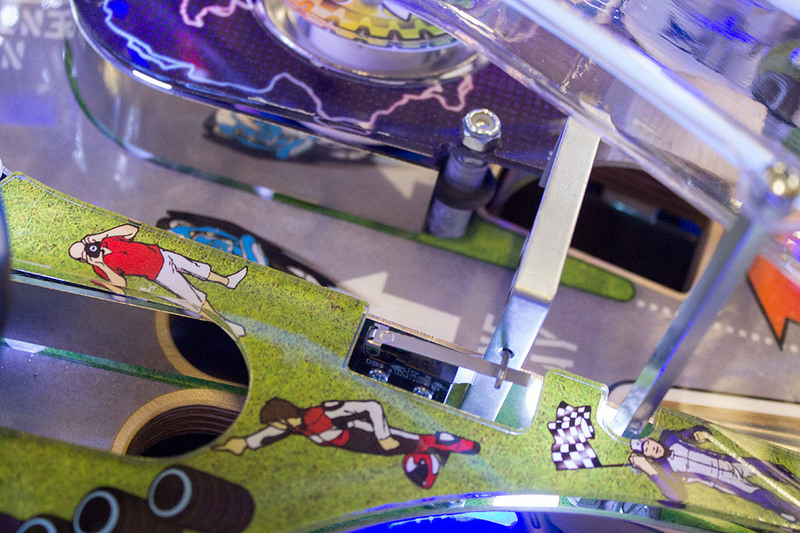 This reduces mechanical failures, playfield wear, and ball hang-ups, while making the playfield easier to clean. 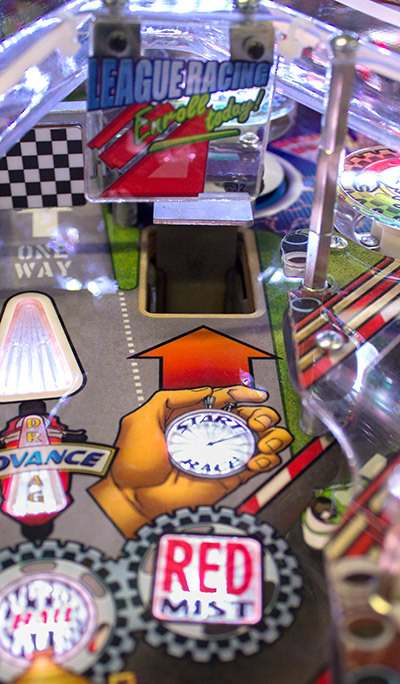 The downside is the lack of any physical indication of when a switch has been activated, such as when a ball rolls up a lane but doesn’t quite make it to the top. Did it pass over the spot where the switch is located, or not? Self-adjusting inductive ball sensors have also had a checkered reputation for reliability, with some earlier self-adjusting boards being swapped out for manually-adjustable ones. Only time will tell how reliable these ones prove to be over the long term. 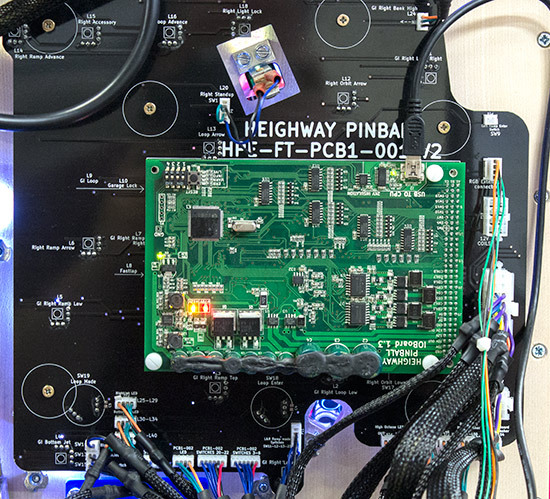 The sensors are mounted on PCBs under the playfield and helpfully circled to aid identification (although the big red arrows are our additions). 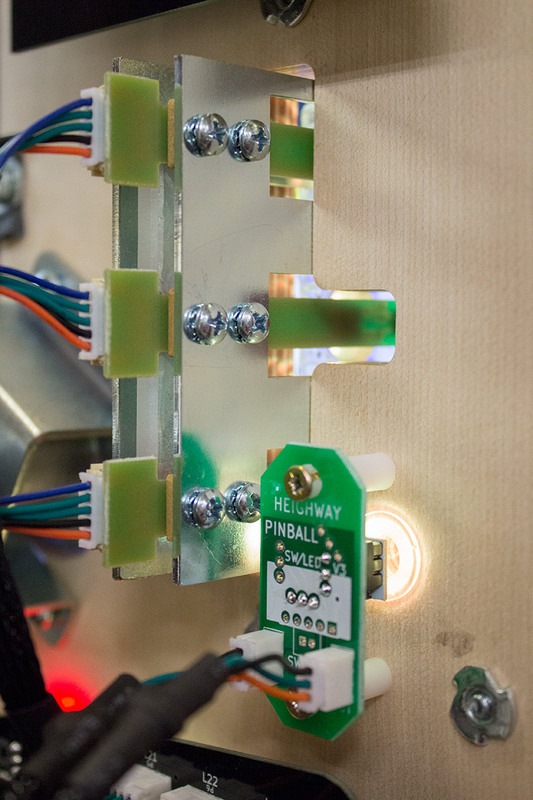 We’ll take a more ‘In-Depth’ look at the circuit boards a little later, but these inductive switches are used quite extensively in Full Throttle to detect a ball travelling through a lane. 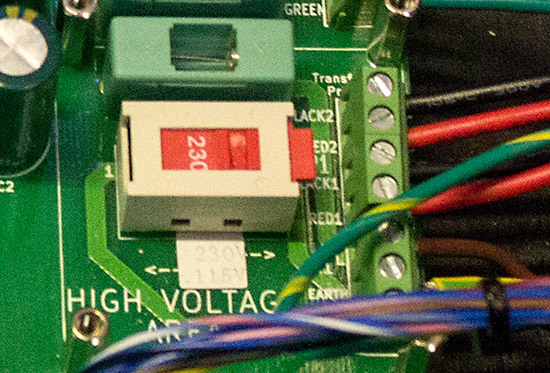 There are some regular microswitches used too, but they are the exception rather than the rule, and only used where an electronic switch wouldn’t work. 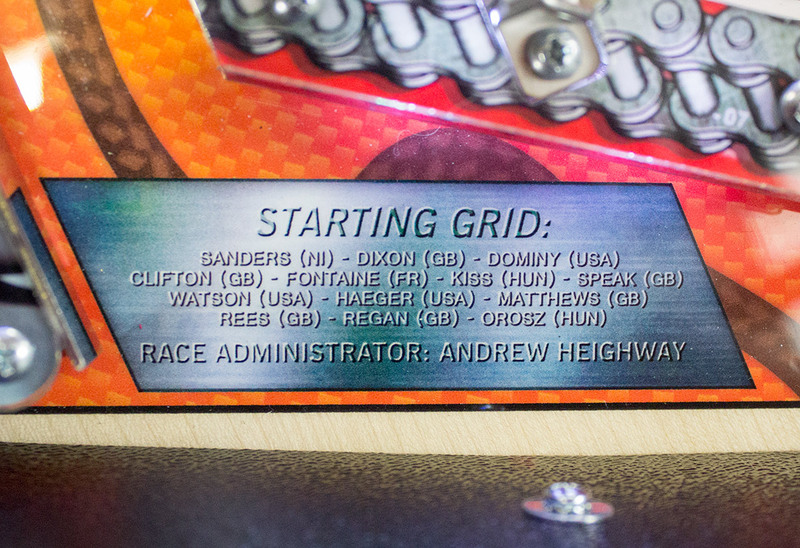 If the ball rolls down the outlane it hits the plastic bottom apron before continuing down to the drain, passing an artwork panel listing the key members of the design team. 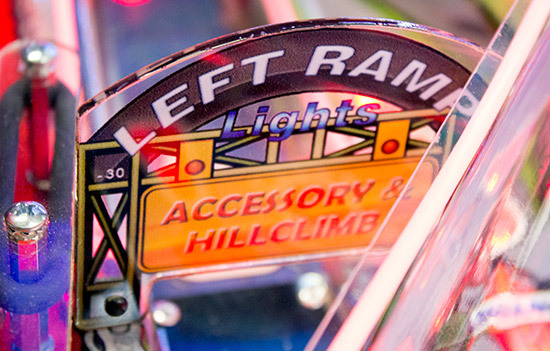 Before we leave the lower left area of the playfield, let’s take a look at the left slingshot. This is a simple mechanism, with a single layer of butyrate on top, cut to provide a mounting point for the inlane’s one-way gate. The method of illumination is novel, with RGB LEDs built into the leaf switches. Unlike most other system this means the light is directed forward rather than radiated in all directions. 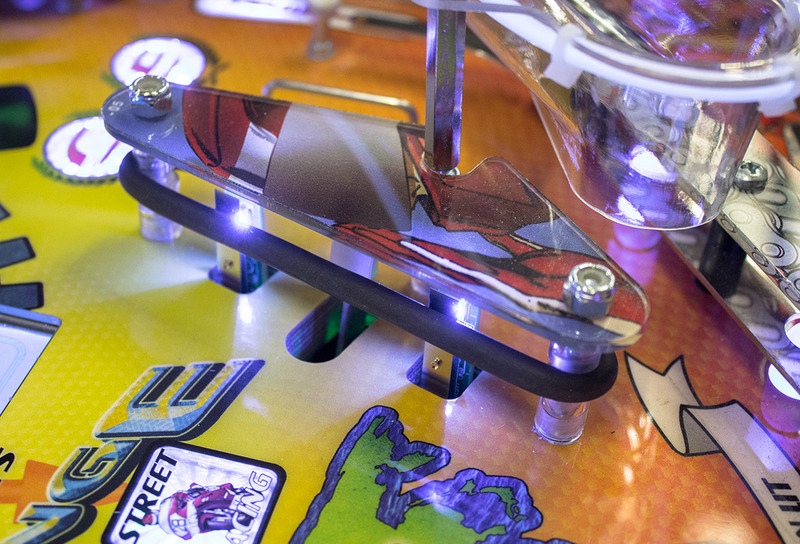 However it gets around the problem some other systems have of mounting RGB LEDs inside the slingshots without using light pipes illuminated from below the playfield, which tends to reduce the intensity of the light. Although it isn’t mounted on a plastic base like the flippers, the whole slingshot assembly – the coil, plunger, kicker arm, and the two switch/LED modules – can be unplugged, unbolted, and dropped through the playfield to service it. 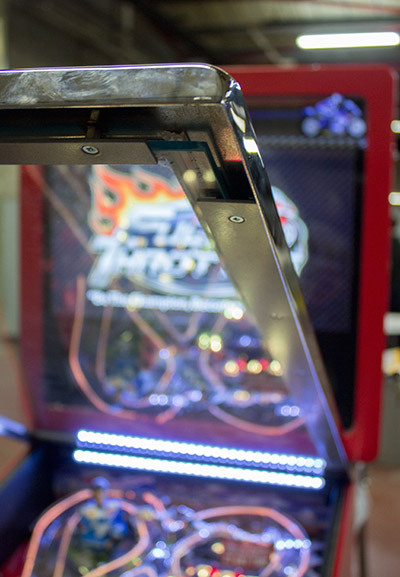 At the top of the left inlanes/outlane combo is an adjustable star post which provides some adjustment over the game difficulty, although the unusual arrangement means the exact effect of moving the post is less obvious than on more conventional designs. 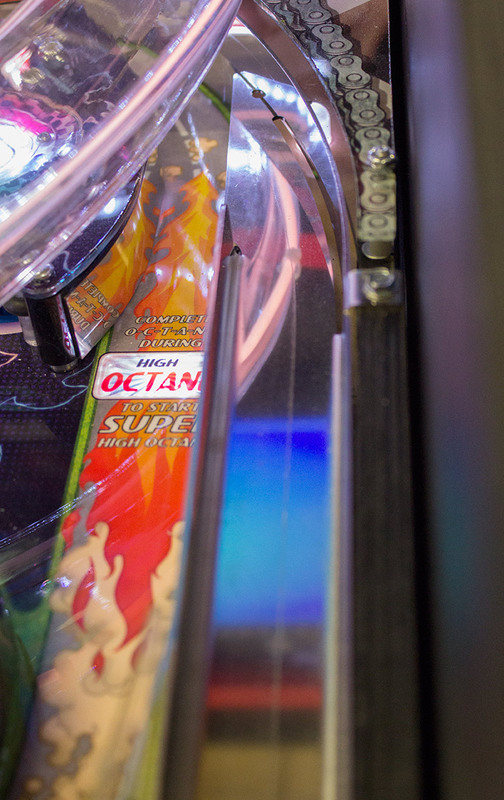 Just up the playfield from that adjustable post is the first of two target banks which form the O-C-T-A-N-E targets. These three targets are all internally lit with RGB LEDs, negating the need for playfield inserts to indicate their status since they can light up or change colour to show when they are hit. 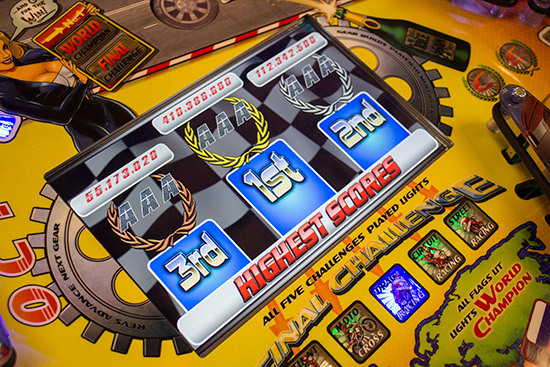 Completing these three and their companions on the other side of the playfield lights the right orbit for High Octane scoring – a timed frenzy-style mode where all switches score extra points – which can be kicked up to Super High Octane by completing the targets again while High Octane is running. The three targets are on the front face of an island, the back of which is curved to form a lane which feeds the left-most inlane. We’ll look at the reason for that a little later in this review. 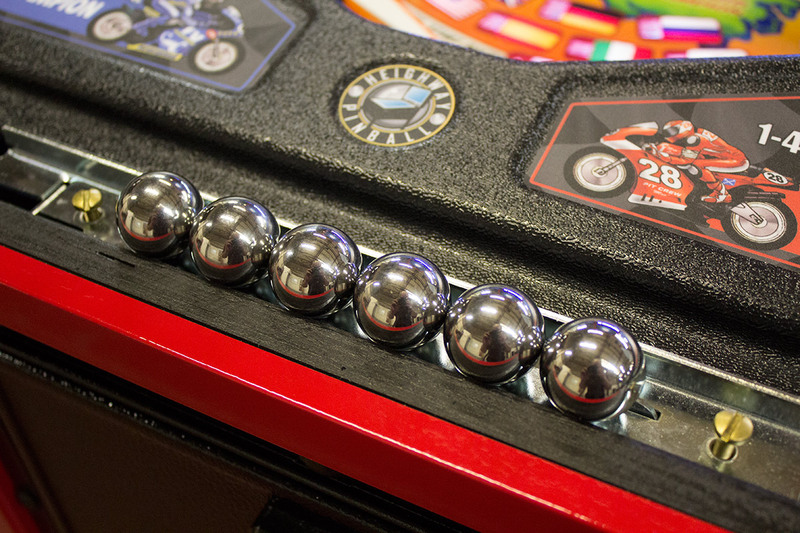 Moving round the playfield, the next shot is the captive ball. This shot performs a number of functions. 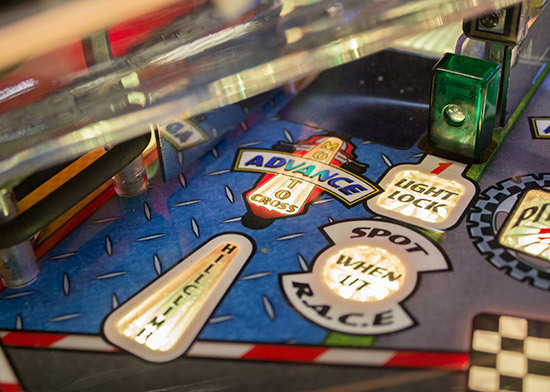 Firstly, it advances towards the Stunt Challenge feature, then during a race it adds more time for you to complete the required shots, and finally it can be a jackpot shot during multiball. The captive ball is positioned at the start of a short lane, with a second, non-captive ball behind. This ball rolls up the lane and hits a standup target at the end to register a valid shot. Also at the end of the lane is a motorbike model. This is cable tied to a pivoted metal plate, below which is a solenoid which can make the bike do a very quick wheelie. 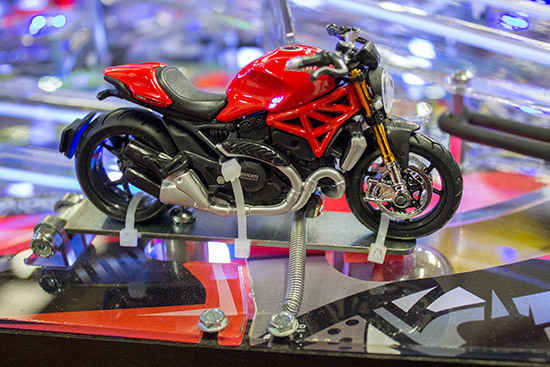 The bike featured in this game was a Ducatti, but it can be any one of eight possible bikes used during production. The white cable ties look rather unsightly and could be improved upon for home use. The spring stretched across the plate to bring the bike back down is also cosmetically-challenged as well as being a little too restrictive, only allowing very limited movement of the bike. It’s functional for site operation, but again, the design of this could be improved. A little further up the playfield is the first of the game’s two ramps, and as it’s on the left of the playfield that would make it the left ramp. The left ramp advances towards the Moto Cross Challenge feature and then advances through it once it begins. 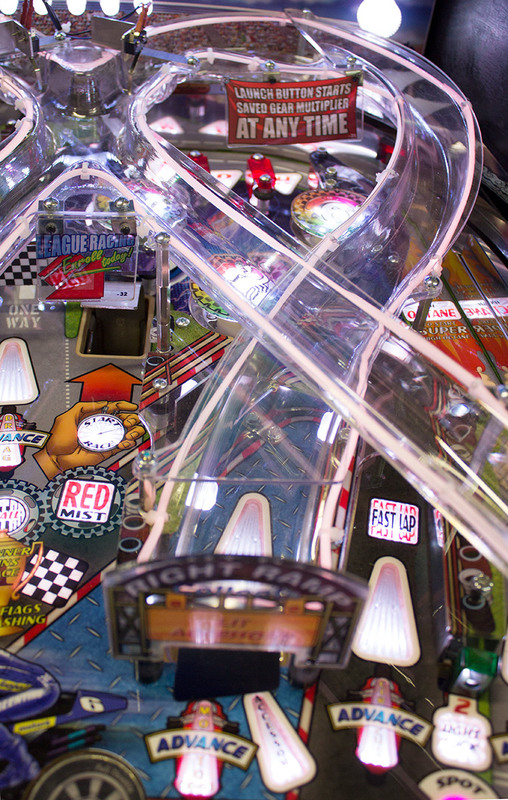 It can also be one of the required shots during a race, score jackpots, and spot an accessory for collection on the right ramp. 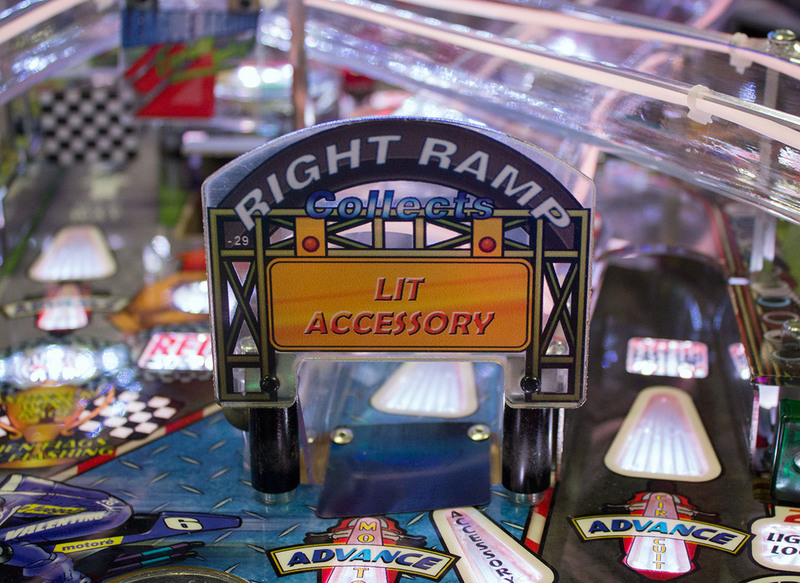 The insert showing it is ready to score a jackpot or make a pass during a race is under the ramp and semi-hidden by the right ramp return, so you need to make a special effort to check whether it is lit. The left ramp takes the ball to the back of the playfield before curving round 160° and entering a crossways intersection with the right ramp. The large ramp assembly is actually made up of three pieces. The left ramp is one piece which ends just before the intersection. There’s an equivalent second piece for the right ramp, while the intersection and the two return ramps which run down to the left and right inlanes are a large third piece. 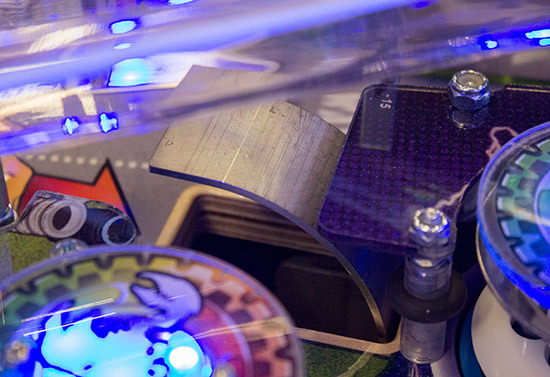 Successfully making the ramp shot is registered by one of the game’s microswitches – a roll-under switch mounted above the ramp. 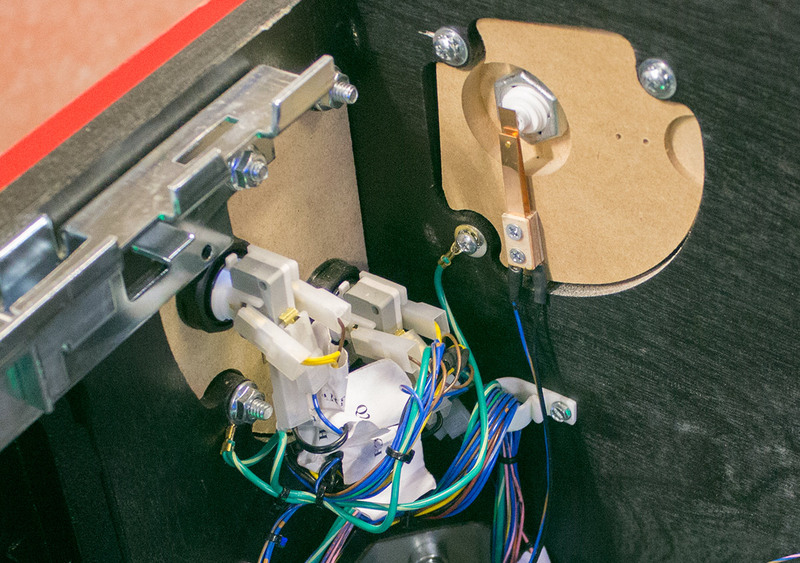 This is also not very attractive and could be improved either by tidying-up the cables a little more or by putting a suitably-artworked cover over the entire switch assembly. 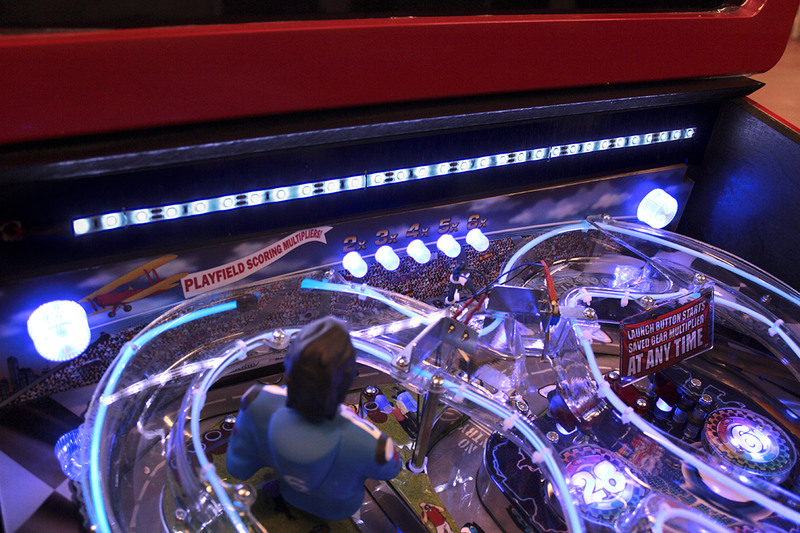 After the switch, the ramp continues across the playfield, running down to the bottom right corner where it deposits the ball into the right inlane. The drop-off point of the ramp is far enough down the inlane that it doesn’t trigger either inlane switch, meaning you can’t keep shooting the ramp over and over to light R-A-C-E letters. The left ramp has a nice shiny metal ball guide on the left entrance to help make the shot a little easier and provide a modicum of protection to the plastic ramp entrance. This is needed because there are no ramp protectors fitted as standard – something home owners in particular might want to rectify. Just to the right of the left ramp entrance is the first of two green vertical standup targets. It’s even got a ‘1’ next to it to prove it. These are used to light the lock for Full Throttle Multiball and also can be lit to add a letter to R-A-C-E which is usually lit by the inlanes. 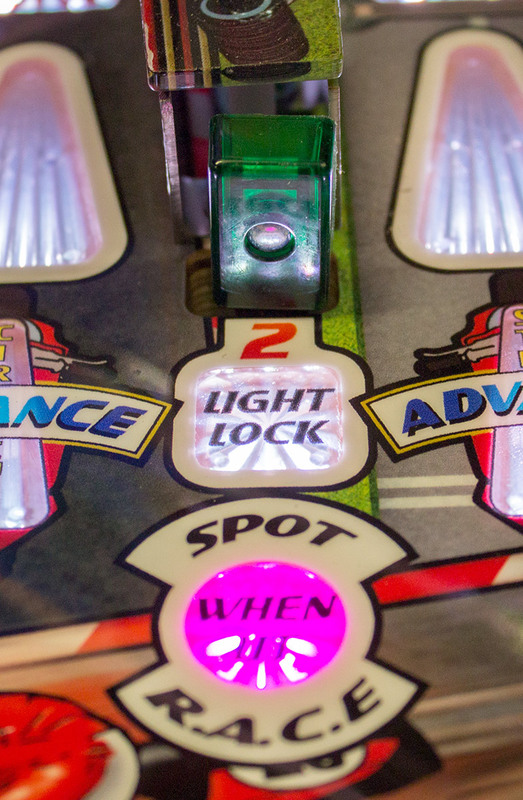 For the first multiball, hitting either green target lights lock, but this gets progressively harder for subsequent multiballs. The lane to the right of the green standup is the left orbit entrance. The orbit lane is the place where you lock balls for Full Throttle Multiball, but it is also used for jackpots during the multiball itself. 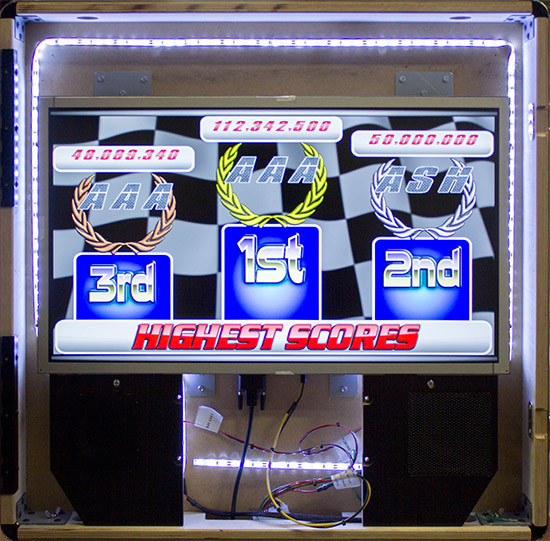 As well as that, it is one of the shots lit during a race to move up the leader board, and it advances towards Street Challenge. 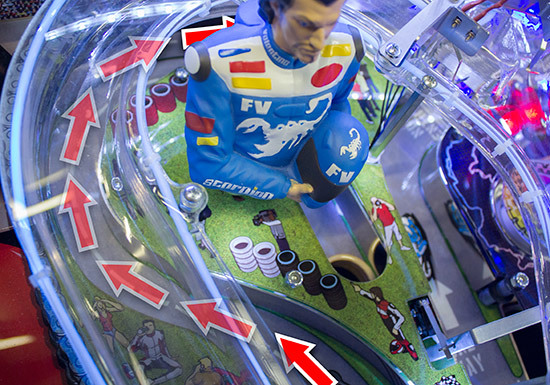 The lane initially curves to the left so it passes under the left ramp and takes up a more traditional left orbit position, before curving right, passing behind the model of Francisco Valentino, and on across the top of the playfield. While we’re up here, let’s say a few words about the game’s antagonist, Francisco Valentino. Valentino doesn’t directly interact with the ball at all – he’s not a ‘bash toy’ – so he’s purely decorative. 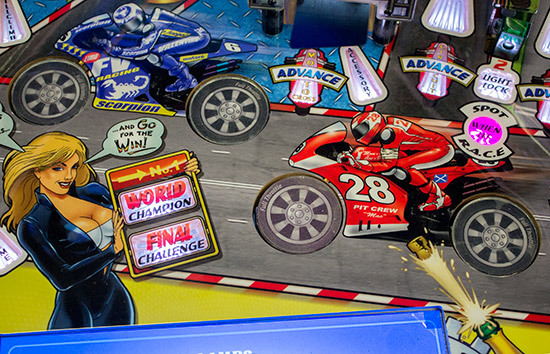 But he is motorised, so he can turn left and right in response to events taking place on the playfield. In earlier software he was something of a loose cannon, seemingly randomly pointing in any direction – even sulking and facing the back panel for long periods. The latest software reins him in much more and keeps him more or less pointing in the right direction. 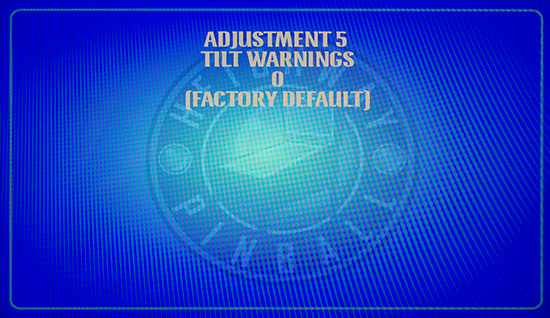 There is a entry in the test menu to manually set his position, which seems to do the trick in case he ever ends up off-axis. Valentino taunts you during races, making jokes at your expense and being decidedly ungracious should you have the brazen temerity to actually beat him. But back to the left orbit, and as the ball passes behind Valentino there is a magnet in the playfield which can grab it and drop the ball down the ‘Pit Lane’ into a hole which serves as The Pits. The ball is transferred by a subway from The Pits to a nearby kickout scoop where it can be held while ball lock or multiball start effects take place. 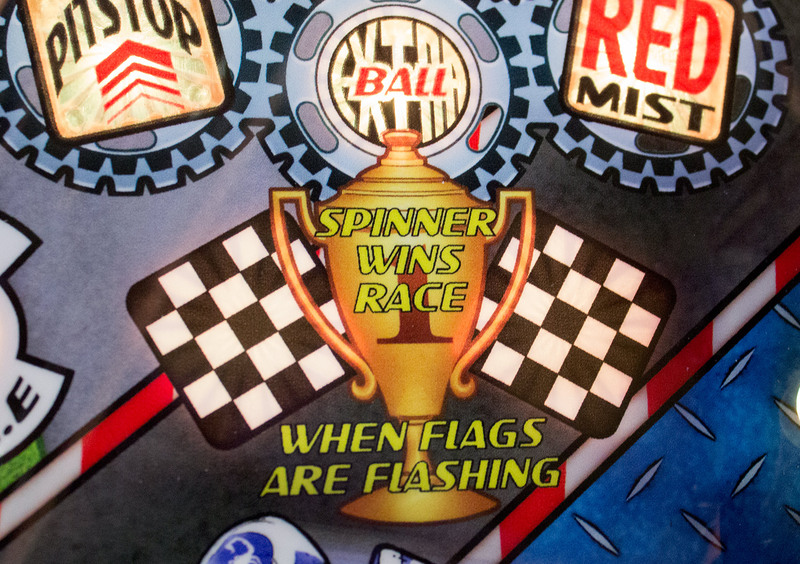 If the lock isn’t lit, then the ball isn’t grabbed by the magnet and it continues to either to top rollover lanes or all the way around the orbit. Just to the right of the left orbit lane – and separated from it by a single post – is the centre lane. 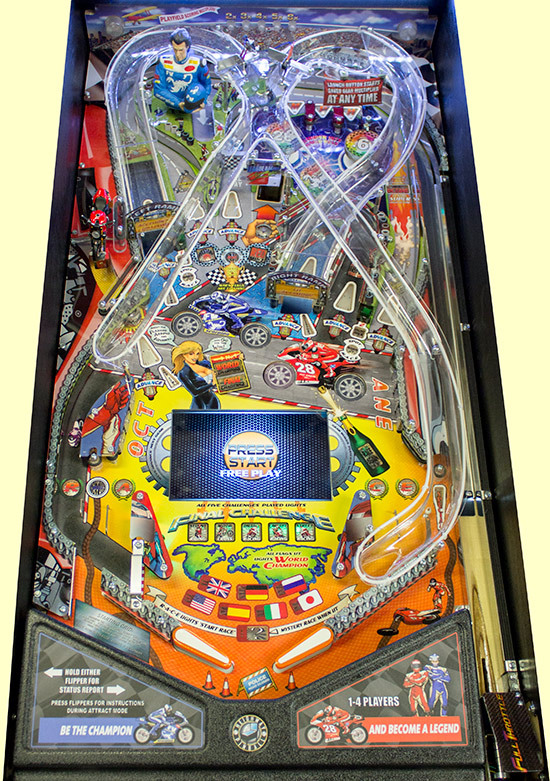 The centre lane is home to the games only spinner which, like the two ramps, uses a microswitch to detect the spinner spins. 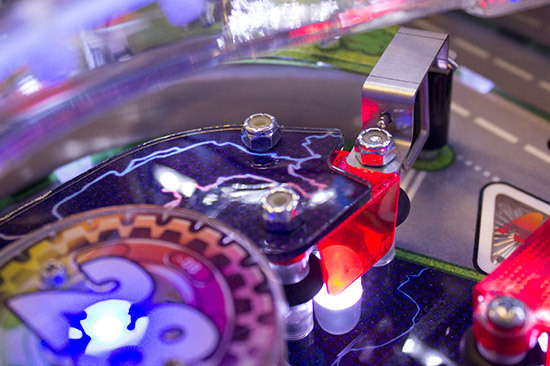 Detection of a completed shot is usually performed by another induction switch below the playfield, but the spinner is sometimes used to complete features too. 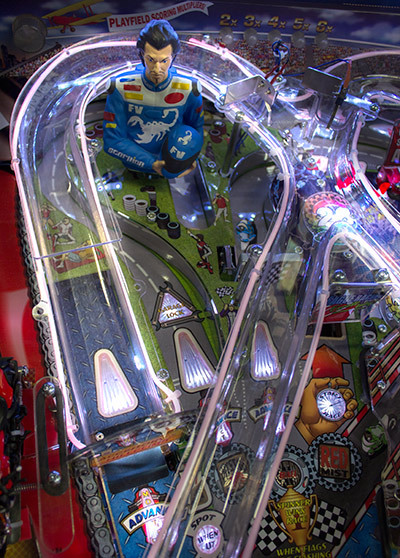 The centre lane is an important shot to master since, when the two chequered flags are flashing, it is the final shot needed to complete any of the races. 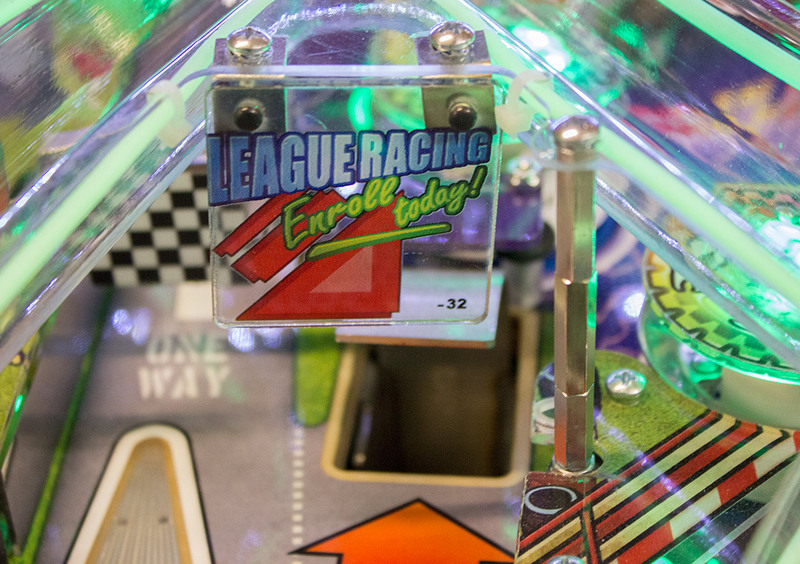 It also awards an extra ball when lit just like the left outlane, advances towards and through Drag Challenge, and can be a required shot to progress through a race or score a jackpot in multiball. Like the left orbit entrance, the centre lane turns right and feeds the ball into the orbit lane as it passes across the top of the playfield. 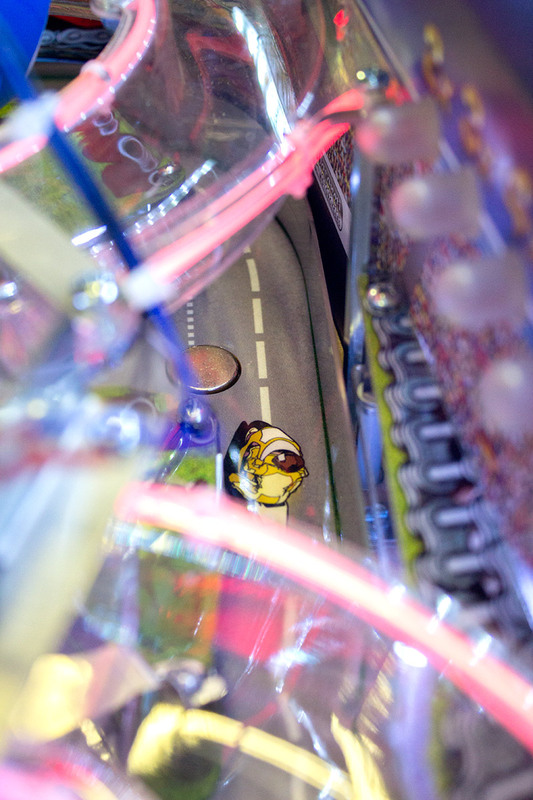 At the top of the lane is a one-way gate which prevents a bouncing ball in the top rollovers area from rolling down the lane. Before we explore that area any more, we just have one more shot to look at, and that’s the scoop. This is mainly a left flipper shot and that’s also where it kicks out to. It is chiefly used to start races once R-A-C-E has been completed, or to collect a mystery award when Start Race is not lit. 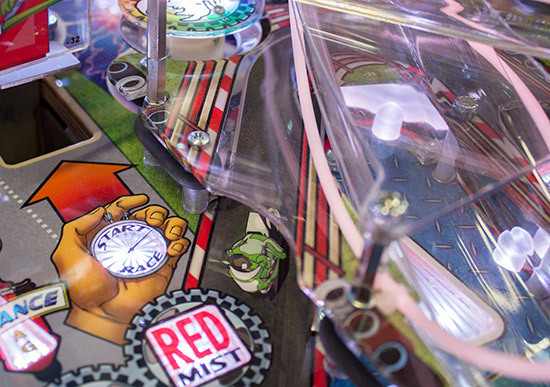 It isn’t a race shot, nor is it a multiball jackpot, but it is the place to start the Red Mist mode once you have completed enough inner orbit shots. Both the left orbit and the centre lane travel behind the scoop and into the area above the top roller lanes, so let’s take a look at that area next. There are three lanes, each with a dedicated insert to spell out M-P-H. Lane change allows any lit inserts to rotate left or right, while lighting all three letters extinguishes them and awards a bonus multiplier. To improve the odds of a ball dropping into the rollover lanes rather than completing the orbit, there are two up-posts in the orbit lane. These are under game control and don’t activate during races where time is of the essence. 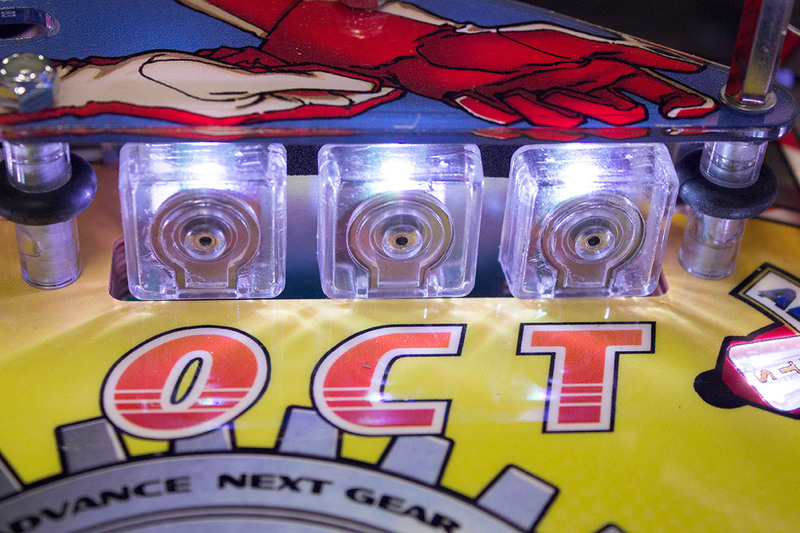 This whole top part of the playfield is illuminated by a strip of white LEDs which is normally hidden from the player by the glass magazine’s frame, but becomes apparent once the magazine is removed. 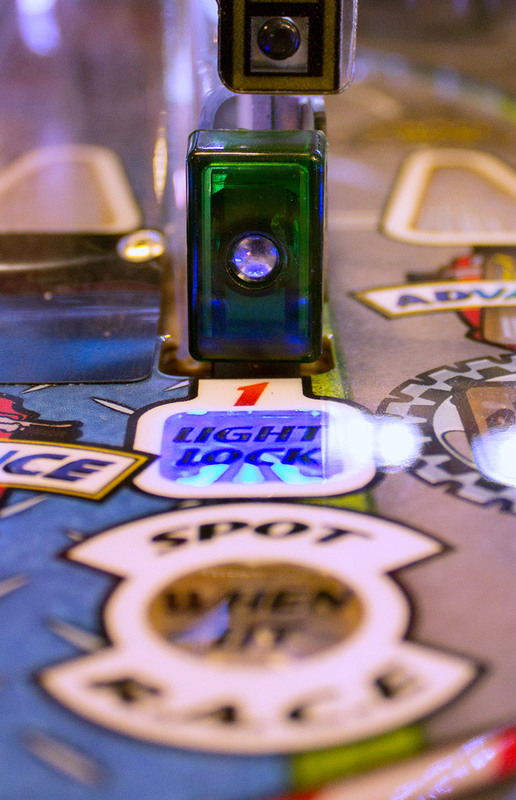 As the ball rolls through the top lanes it ends up in the pop bumper area. The three pop feature flat butyrate caps, each with a different design. The left one shows number 28 which is your number in the game and was, we believe, the number of Andrew Heighway when he used to race cars. 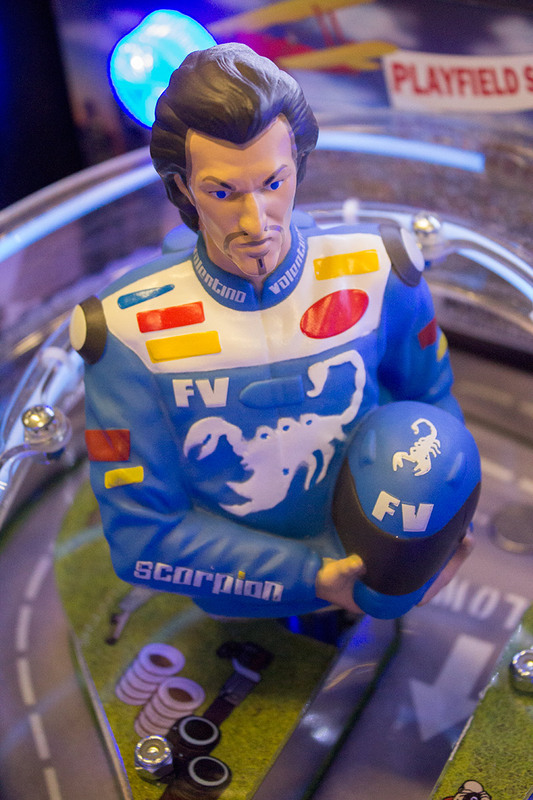 On the right is number 6, the number of Francisco Valentino, whose scorpion insignia appears on the bottom pop bumper cap. 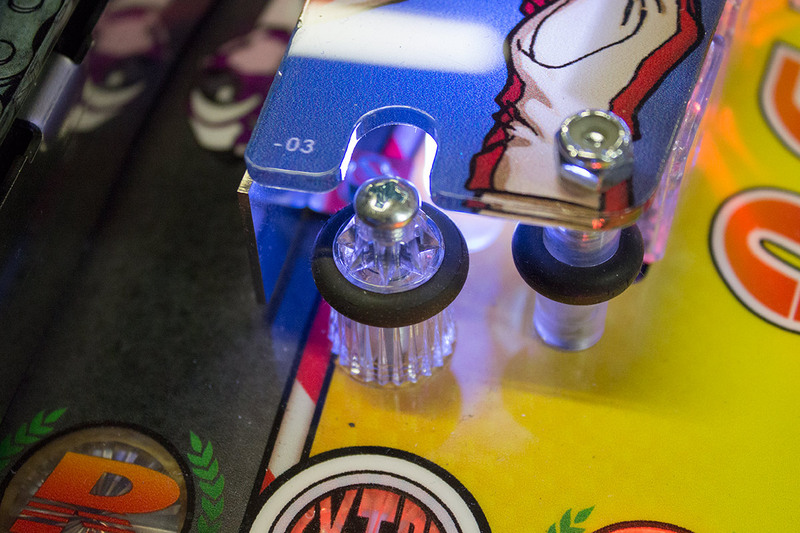 There is no central flasher which fires with the pop bumpers’ solenoids, but each bumper is lit by five RGB LEDs arranged like the number five is represented on a die. 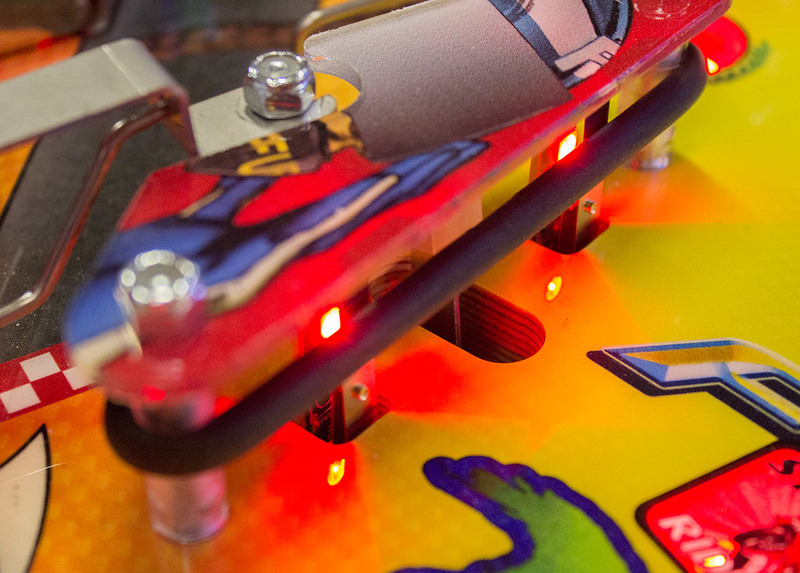 You might notice how the base of the pop bumper looks a little unusual, and that is because, like the flippers and the slingshots, the whole pop bumper assembly can be unplugged, unbolted and dropped through the playfield for servicing or cleaning. 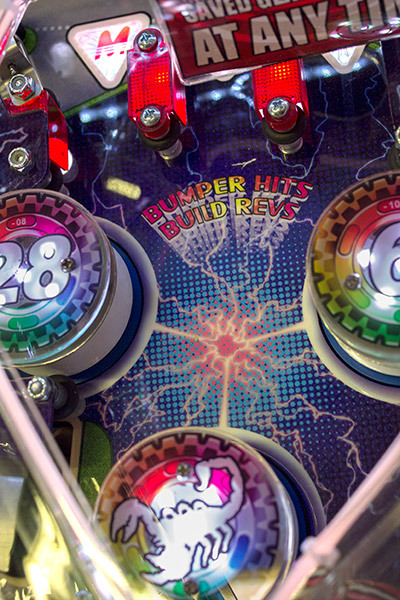 The bumpers are quite active in the game, and even though they only rarely roll the ball back through the rollover lanes to add an extra M-P-H letter, they do increase the rev counter on the display, which eventually increases the gear number which is an important part of the game. 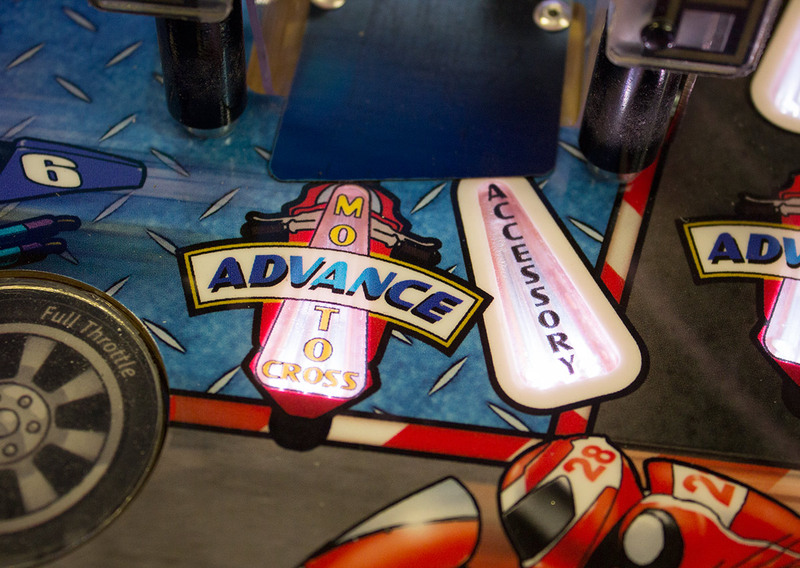 As you shift up through the gears – either from the pop bumpers for from a super skill shot – you advance a playfield multiplier, the value of which is indicated on the game’s back panel. 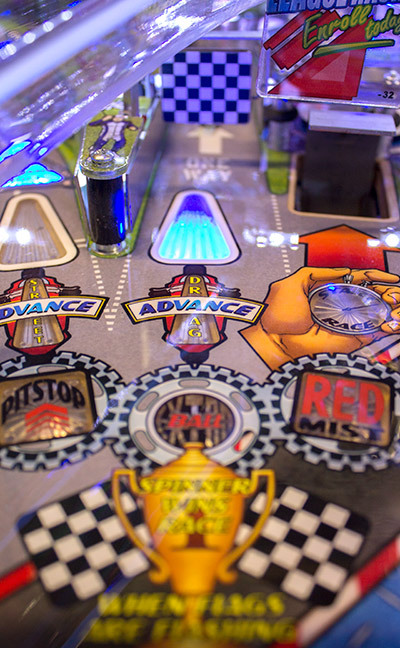 This playfield multiplier is a timed feature which can be started any time at least one ball is in play by hitting the flashing start button. 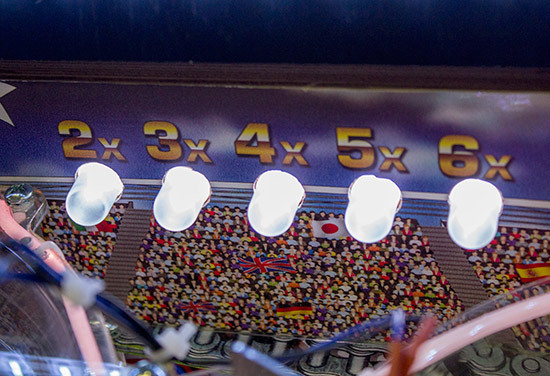 With up to 6X playfield scoring available for ten seconds, building up and then using the multiplier judiciously should be a key part of your strategy. 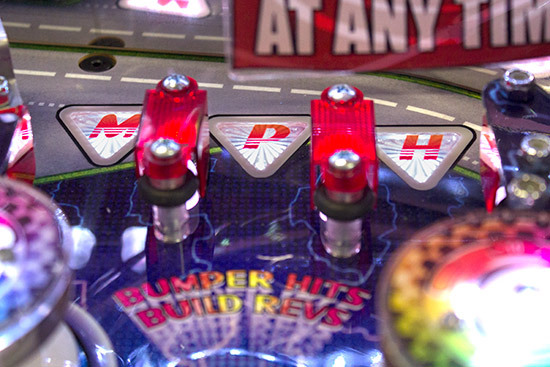 There are two exits from the pop bumpers. The left exit rolls the ball either into or just past the scoop, while the right exit feeds into the right orbit lane entrance and down to the right flipper. Returning to the mid-playfield shots, after the scoop we move right and come to the right ramp. The right ramp advances Moto Cross Challenge and collects an accessory when it follows a left ramp shot. It can also be a required shot during a race, and can be lit for jackpots during multiball, with the insert for these located under the ramp (and behind the arch plastic). The ramp is almost a mirror image of the left ramp, curving right before turning left and entering the 4-way intersection. From there it crosses the playfield, before dropping the ball in the lane above the left-most inlane, which then sends it back to the left flipper. We’ve seen the fibre-optic light pipes in many of these pictures, so let’s take a quick look at those. The name ‘light pipe’ is an accurate description of how they work. Unlike electroluminescent (EL) wire which tends to be thinner and single colour only, the light pipe doesn’t generate light itself. 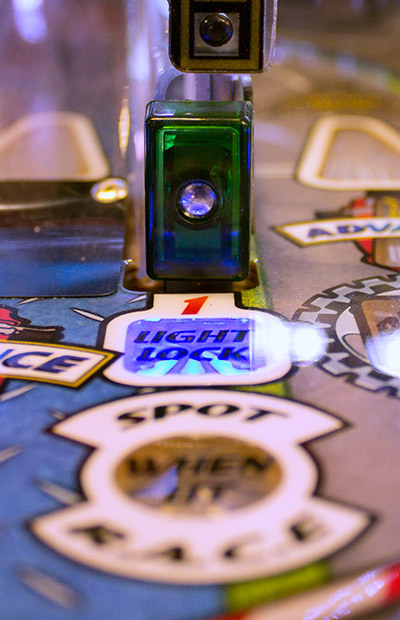 Instead, the light comes from an enclosed lightbox – or two lightboxes in the case of Full Throttle – with a hole in the top into which the fibre-optic pipe plugs. The lightbox contains high-power RGB LEDs allowing the light to change colour, while the pipe is deliberately made to be ‘leaky’, spilling light along its length. So that’s how the light pipe system works. We’ve still got a few more shots to go, and our next one is the fastest lane in the game. It’s the inner orbit. The inner orbit starts as a regular straight lane but takes a rapid 120° turn to the left, sending the ball diagonally across the playfield. The exit is angled such that a fast ball will travel across the playfield and end up in the lane behind the O-C-T targets. This then sends the ball into the left-most inlane and on to the left flipper for a repeat Fast Lap shot the the inner orbit. Making this loop over and over is valuable during a race but it soon becomes difficult to control, since there is very little to slow the ball down and the flipper’s flip just adds to the momentum. The danger is that your shot is not quite as strong or as true as you might hope. A weaker shot might not make it as far as the lane behind the O-C-T targets and may instead end up with the ball in the inlane/outlane area, where there is the chance of an outlane drain. 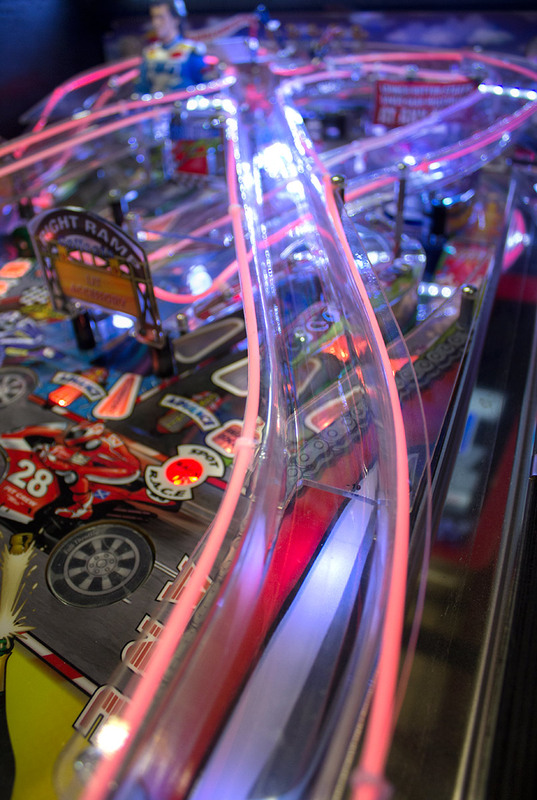 The inner orbit advances the Circuit Challenge feature, advances Red Mist, and can be a lit shot for multiball jackpots and race overtakes. There are two sensors under the playfield which register the ball both entering the lane at the bottom and exiting it at the top, so you need to make the whole lane to get credit for it. To the right of the inner orbit is the second green vertical standup target. This acts just like the first green standup over by the left ramp, lighting lock for Full Throttle Multiball and spotting a R-A-C-E letter. That’s about all we can really say about it, so we’ll move our focus right just a little more, where we find the right orbit entrance. 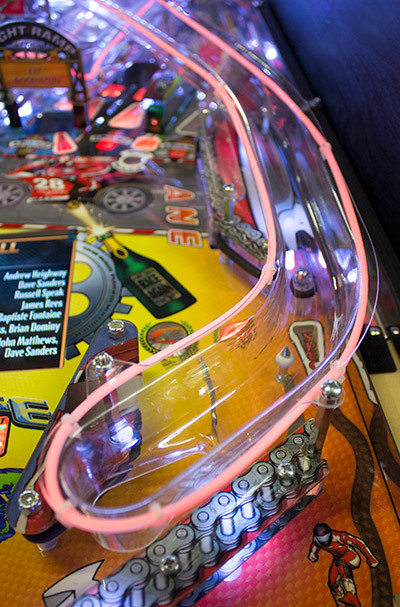 As you might expect, the right orbit lane travels up the right side of the playfield and curves left to pass above the top rollover lanes where it joins the left orbit lane. At certain times the left up-post will rise to stop the ball, forcing it into the rollover lanes, and other times the post will stay down creating a true orbit lane. If the lock insert is lit, however, the magnet above the pit lane will activate and grab the ball in order to lock it. 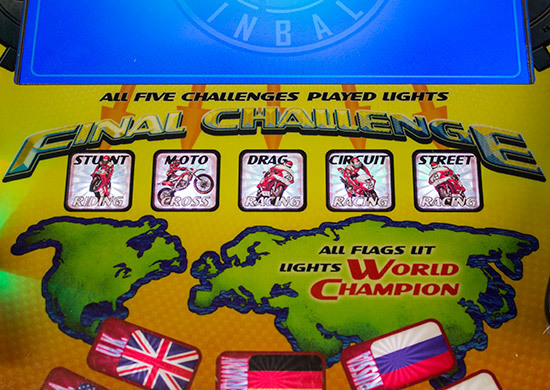 The right orbit also advances towards Street Challenge and can be lit to award jackpots and progress through a race. It also starts the High Octane feature when it has been qualified by spelling O-C-T-A-N-E from the six standup targets, and Super High Octane in the same way if it is done while High Octane is already running. 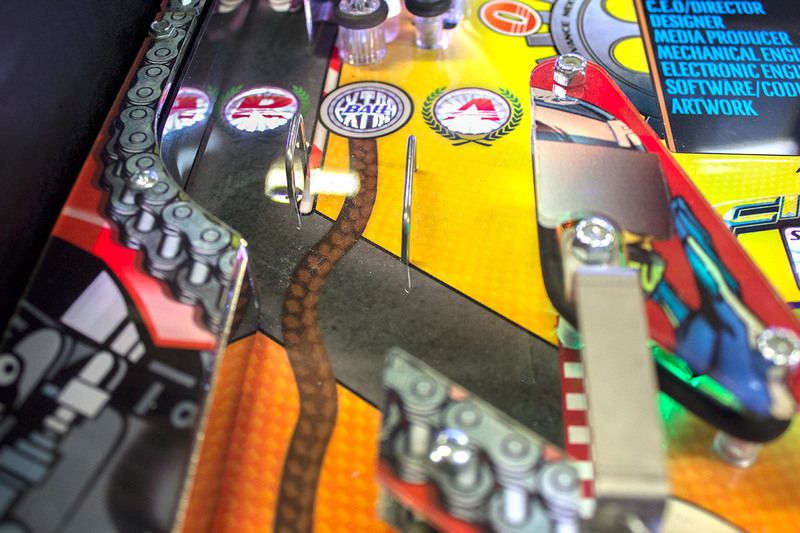 As it travels towards the top of the playfield the right orbit lane is joined by the shooter lane, allowing a new ball to either end up in the top rollover lanes or complete the orbit for a chance at scoring a super skill shot award. The ball shooter is a purely automatic version with no manual shooter rod and so no option to soft-plunge. The launched ball travels up the right side of the playfield and joins the right orbit lane just above the exit from the pop bumpers. As with all the ball guides in Full Throttle, the sides and base of the shooter lane – at least, once it stops being wood – is mirrored. 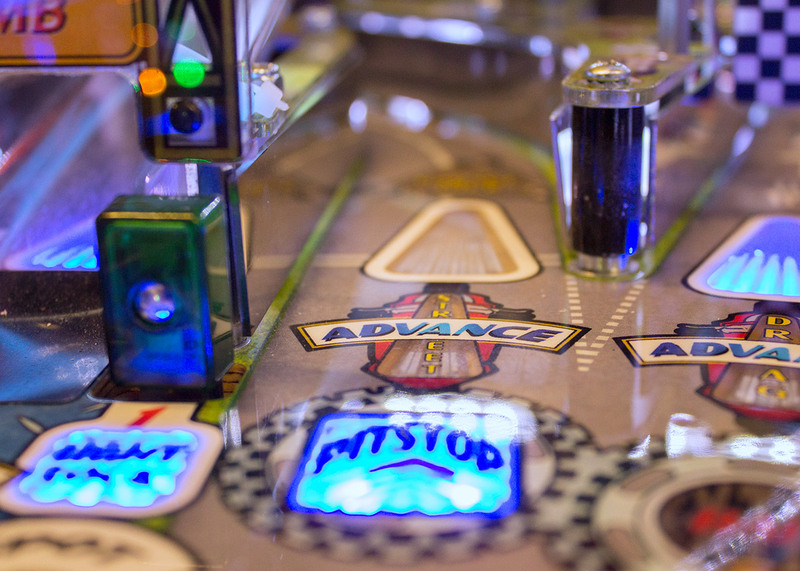 This mirroring effect really brightens up the game, reflecting lamps and inserts, and giving the impression of a much roomier playfield. 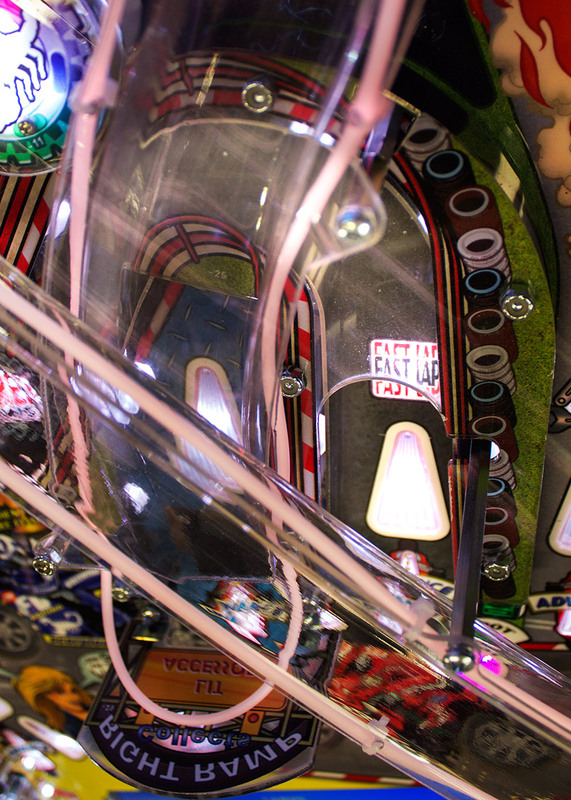 True, it is already a widebody, but the reflective ball guides are like fitting mini mirror blades throughout the game. 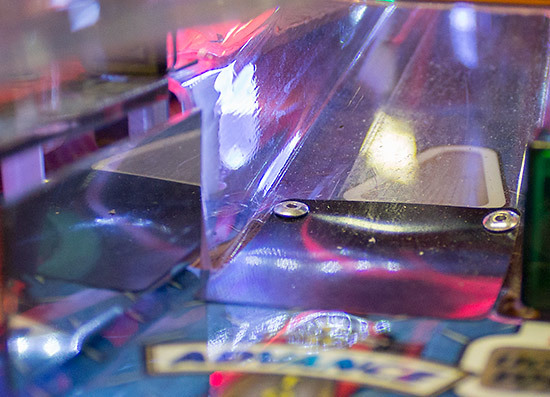 They may eventually end up with ingrained ball tracks, but they will still look more attractive than the dull brushed steel found on other games. The final dedicated shot in the game is to the three-bank of standup targets just below the right orbit entrance. 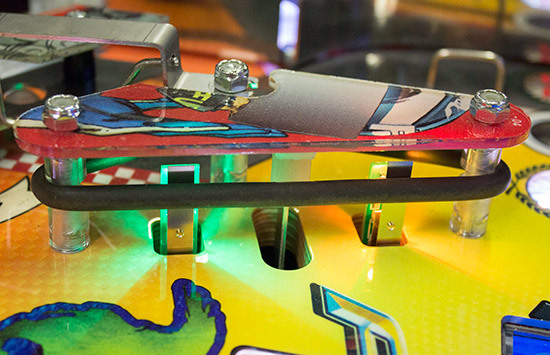 These targets differ from their counterparts on the opposite side by being flush against the side of the playfield, and not having a lane (other than the shooter lane) behind them. Apart from that, they operate in the same way and are lit internally with the same type of RGB LEDs. Below the A-N-E targets is an insert showing when an extra ball has been awarded or a ball saver is active, and below that are the two right inlanes and the right outlane. 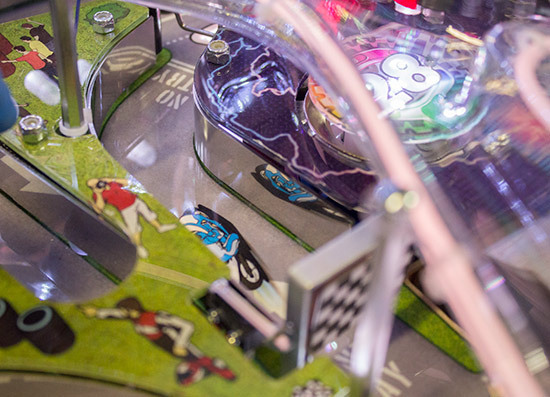 The inlane/outlane arrangement is much more conventional on the right side of the playfield, with two inlanes on the inside and a single outlane on the outside. The two inlanes light the C and E letters of R-A-C-E, while the outlane can be lit to award a special. Just like on the left side, there is an adjustable post at the top of the outer lane, but unlike the left, the post on the right is covered by a ramp, making it somewhat tricky to adjust from the top. It can, however, be loosened and slid up or down from under the playfield. The right slingshot holds no surprises and is very similar to the left one, featuring two leaf switches with integrated RGB LED lighting. 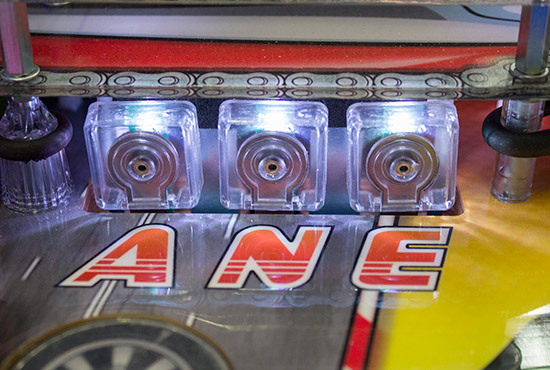 Without the need for an outlane gap and a one-way gate, the inlane ball guide is a little longer on the right but still features two light pipes which are lit by RGB LEDs under the playfield. All of which brings us back to the flippers. Spelling R-A-C-E from the inlanes or the lock targets qualifies one of the national races indicated above the flippers. 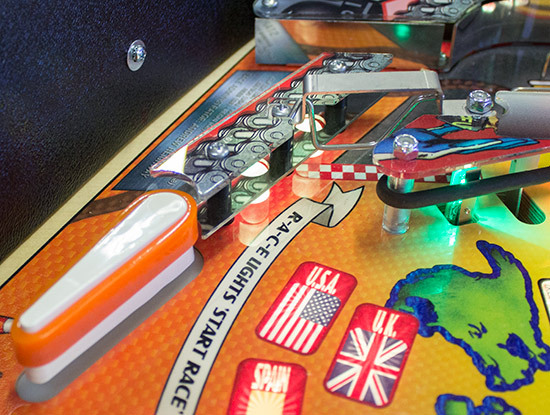 Once the timed race is started by shooting the scoop, multiple shots are lit to advance your position up the leader board. 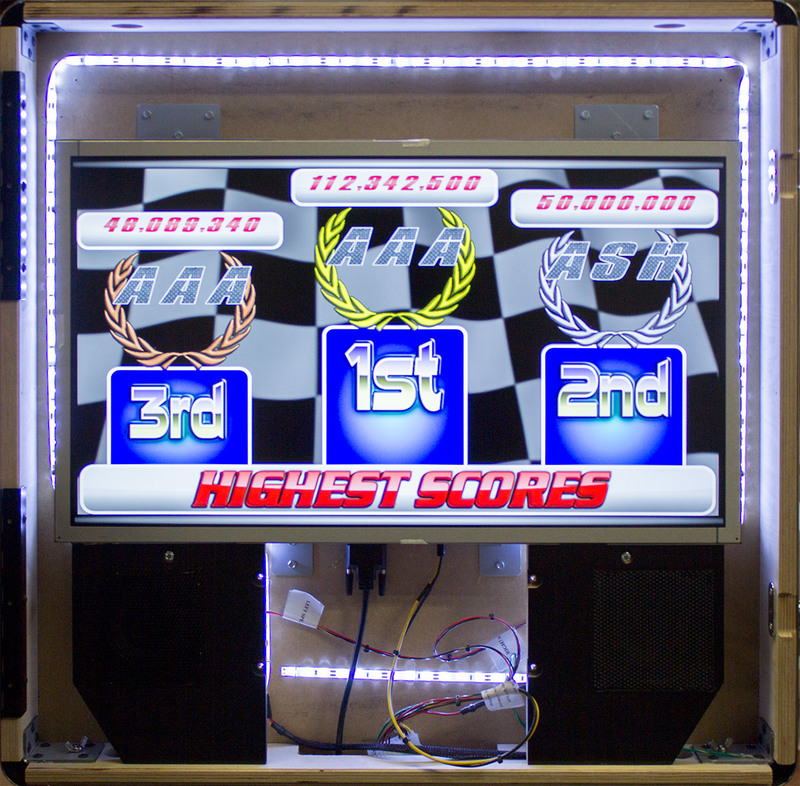 The aim is to move up to first place on the leader board and then shoot the spinner to cross the winning line and win the race. 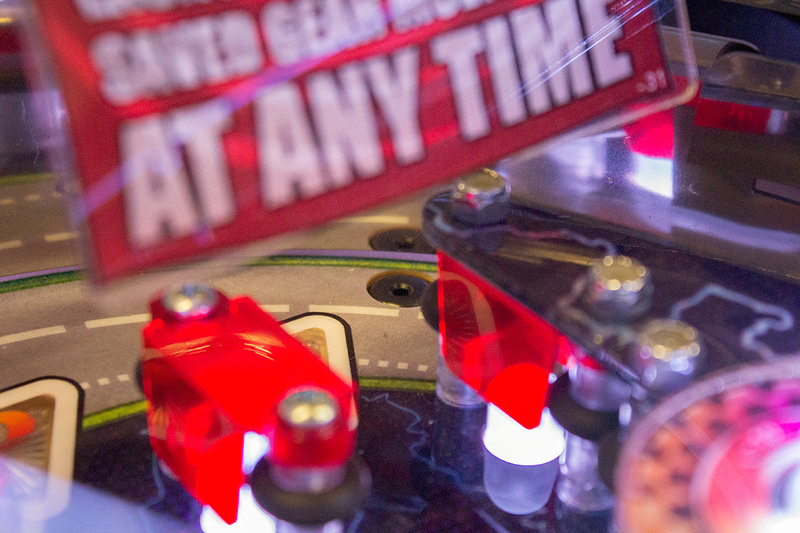 If time begins to run out, shooting the captive ball will give you a little more. You need to win all seven races to become the World Champion, including the race labelled UK on the playfield but Great Britain on the display and in the voice call. 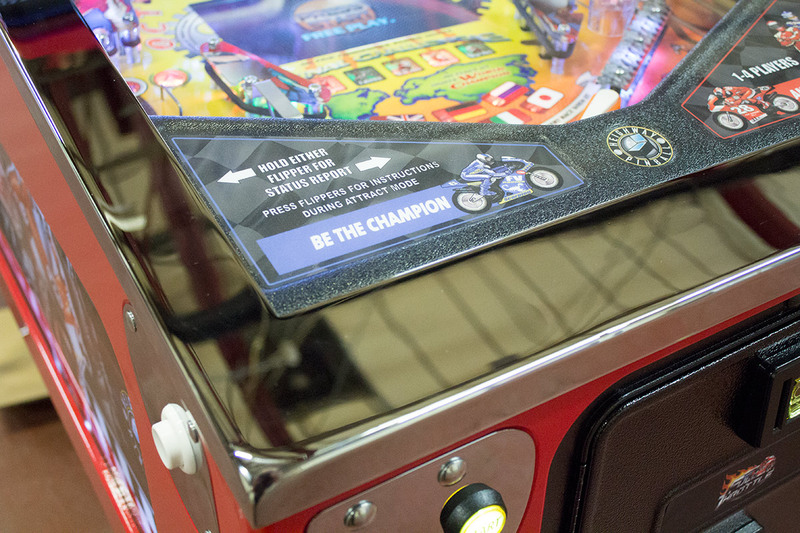 Above the race inserts are more inserts for the five Challenges – Stunt Riding, Moto Cross, Drag Racing, Circuit Racing and Street Racing. Each Challenge is associated with a particular shot, as we have seen above. Initially a Challenge requires the shot to be made five times to start it. As soon as the fifth shot is made the Challenge begins immediately, with another ball launched into play. You then need to make the same shot again to collect trophies, starting with bronze, moving up to silver, and then finally winning the gold trophy. In the meantime, the other major shots are all lit to score jackpots. The corresponding Challenge insert also lights in gold, silver or bronze to indicate your achievement. 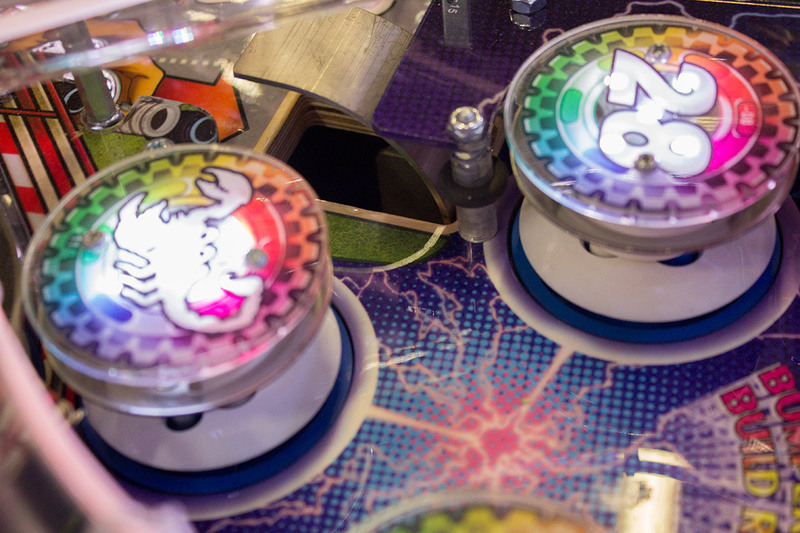 However, while you are playing one Challenge, the shots required to start the other Challenges still count, so you can start a second, third, fourth or fifth Challenge while the first is still running with each adding another ball to the mix. Stacking Challenges increases the value of jackpots and gives you a timed ball saver each time a new Challenge is started. 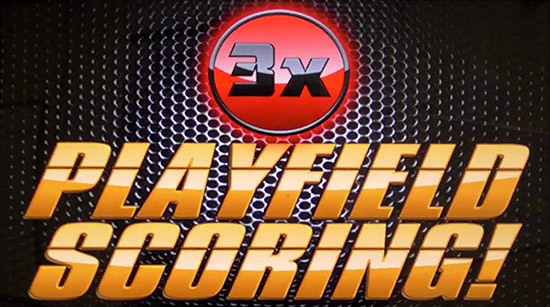 With several Challenges started, now might be a good time to cash-in that playfield multiplier for some tasty jackpot values. 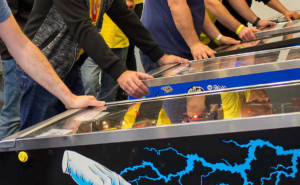 When all five Challenges have been played and you are back to a single ball in play, the Final Challenge multiball mode can be started by locking a ball. All the trophies you won during the individual Challenges then affect the value of that shot during Final Challenge. If you won a gold trophy, that shot is worth 8M points. A silver makes it worth 6M, and bronze is 4M. Otherwise it scores 2M. Maybe you should save the playfield multiplier for this stage in the game. If you did well, individual shots could be worth up to 48M each for the ten second duration of the multiplier. Just to make the task of getting to be World Champion and reaching the Final Challenge just a little more of a ‘challenge’, there are four spinning wheel discs in the playfield which deflect the ball and do their best to reduce your level of control. 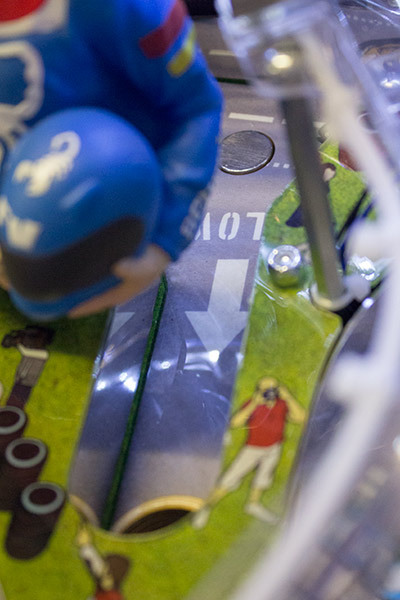 The wheels on early prototype games had a fairly ineffectual surface which made little difference to the ball’s movement, but the production surface is has much more traction. The wheels are still only small, and the fact they are spinning is quite easily overlooked in all the excitement, but they do make an impact on how the game plays. 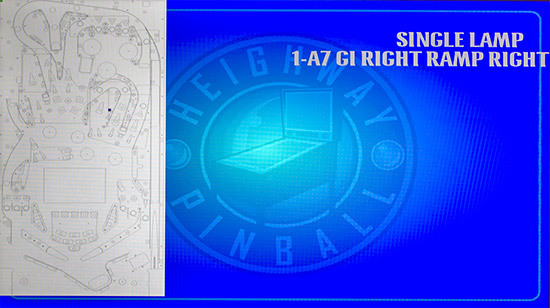 The final item on the playfield we have yet to examine is the biggest unique feature of Heighway Pinball games – the in-playfield LCD panel. It certainly takes a little time to overcome the almost innate practice of looking up at the backbox to see your score or check your progress. 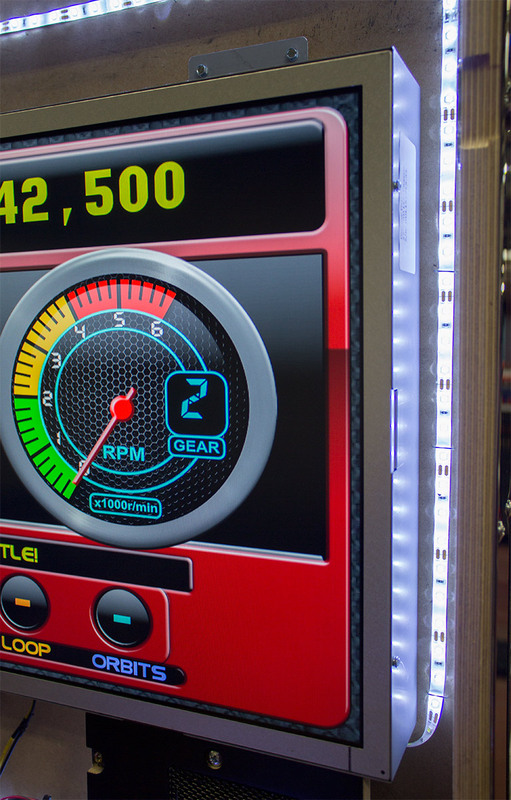 The fact that this particular model also has a backbox display too doesn’t help, of course, but it is genuinely useful to have that information right in front of you as a player and it’s as important to keep an eye on it as much as any of the feature inserts. Without the backbox display the story is a little different for spectators or other players in a multi-player game, since they have a harder time seeing what is happening in the game unless they crowd around the player. So the extra screen is definitely a worthwhile upgrade. Since the graphics are designed for display on the 10-inch panel rather than the 27-incher in the backbox, the design is necessarily bigger and bolder than you might choose if working solely on the larger monitor. That said, we have seen before how sometimes less is more when trying to convey information to the player. Overload them with too many details of scores, values and progress, and it becomes impossible to quickly find the information they really need. While you might imagine that graphics intended for a 10-inch display would look rather ‘chunky’ on a monitor with more than seven times the screen area, that’s not the case at all. In fact they work remarkably well, looking bold, bright and rich. The standard gameplay design shows the key information such as the current player’s score, player number, ball number and number of credits at the top, with game-specific information displayed below. 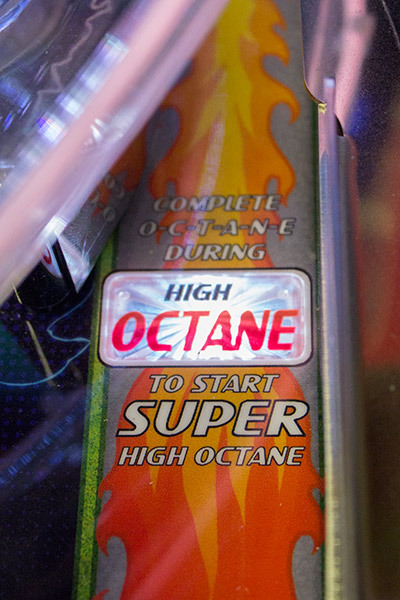 The panel on the left shows details of the current mode or award values, or other players’ scores in a multiplayer game. The panel on the right is occupied by the tachometer which increases with pop bumper hits, and shows the current gear selection which equates to the playfield multiplier shown on the back panel. Along the bottom of the display are the counters for the five Challenges. 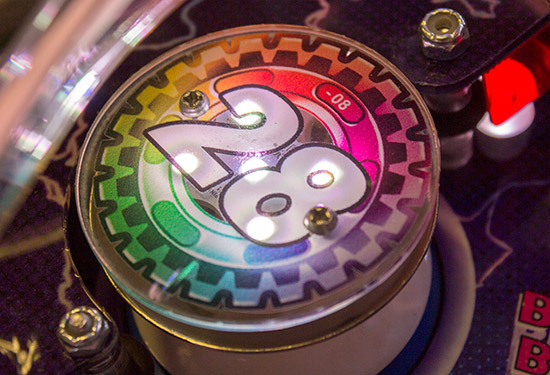 These are all colour-coded, matching the colours of the corresponding inserts on the playfield, and all begin at 5 at the start of the game, counting down each time the required shot is made. The shots are, as we have already seen, the captive ball, the ramps, the spinner, the inner orbit (loop) and the orbit lanes. 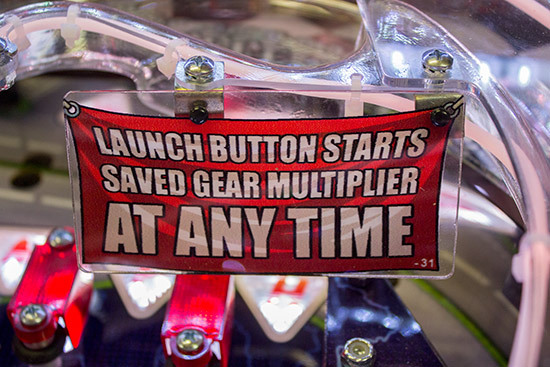 When the required number of shots has been made and the Challenge begun, the mode is no longer available and the counter shows a dash instead. Playing Final Challenge resets them all, but adds 1 to the number of shots needed to start each Challenge. 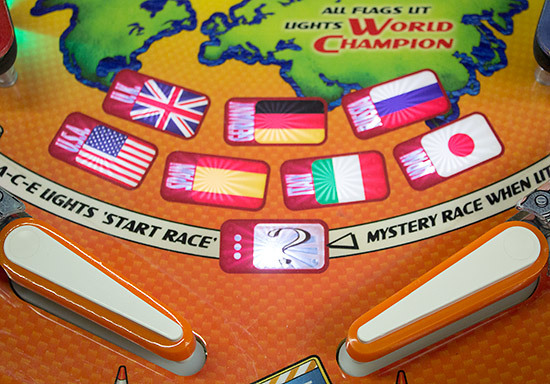 Information about the number of races played and remaining is only indicated by the playfield inserts, although the display does show when a race is ready and provides comprehensive information about your progress during the race. While we’re looking at the display, let’s take a moment to examine the game’s configuration and test menu. 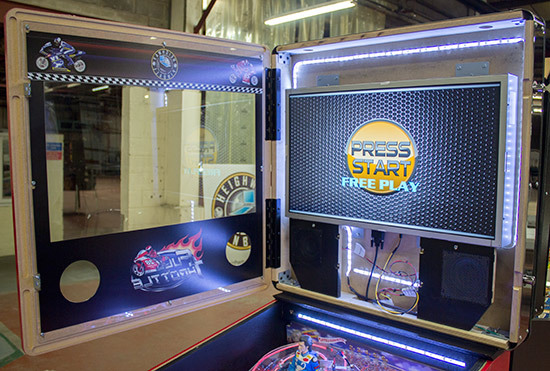 As we said earlier, the system is based around the familiar Williams one, using four push buttons inside the coin door to navigate the menus and select items. Pressing the right-hand ‘select’ gets you in. Any self-detected errors are displayed here. 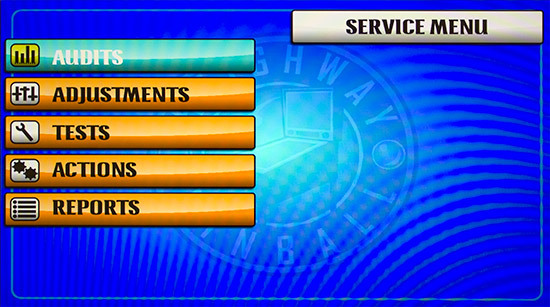 Thankfully there are none, so another press of the ‘select’ button gets you into the menu system. The audits, adjustments and tests are the same as their equivalents in the Williams system, while ‘actions’ equates to ‘utilities’. 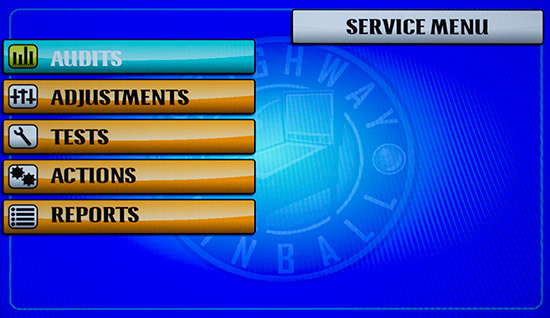 There are several sub-menu levels. 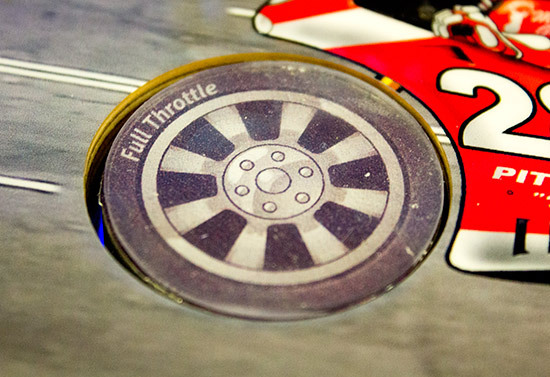 We won’t go into them all here, but the adjustments are further broken down into system-wide adjustments, those just relating to Full Throttle’s rules, pricing adjustments, and the levels and rewards for the high score table. 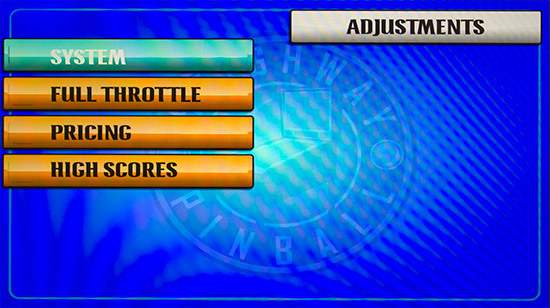 One nice feature we discovered was what happens when you enter the adjustments menu in the middle of a game. 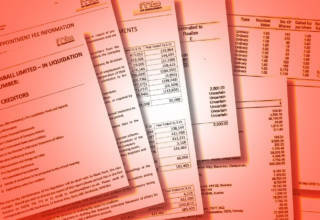 Instead of ‘audits’ we now have ‘modify game’. 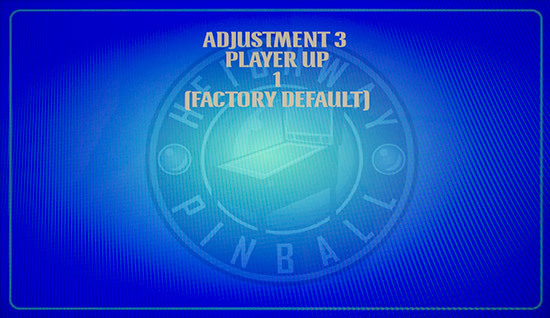 This new menu allows you to change various setting for the current game, including the current player number, the total number of players in a game, the number of tilt warnings the current player has received, the ball number they are playing, and the number of extra balls they have earned. The tests menu also has sub-menus for solenoids, lamps, sounds, boards, and to test individual mechanisms. 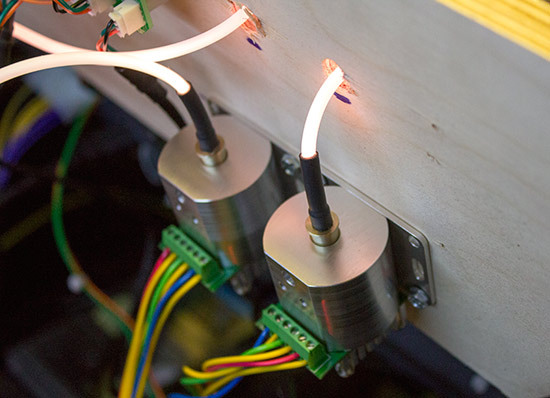 For the LEDs, the test automatically cycles through red, green, blue, white, and off. 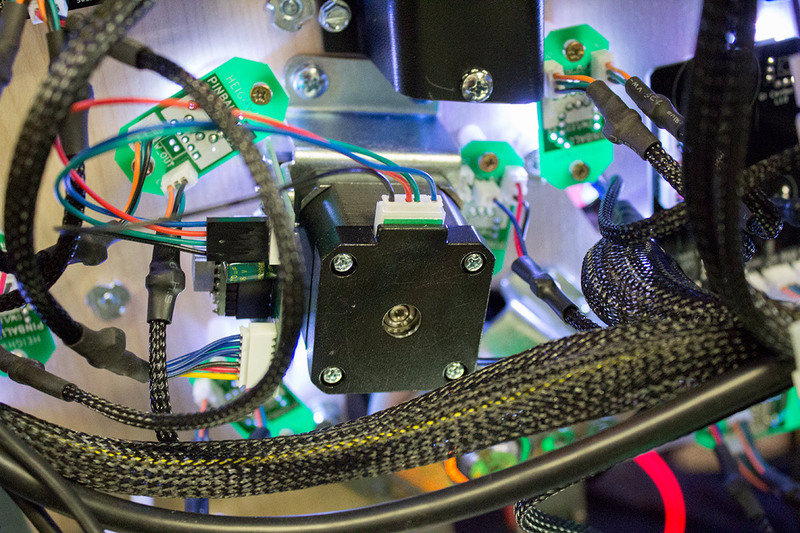 During our testing of the game, we somehow managed to kill all the lighting and solenoids in one part of the playfield. 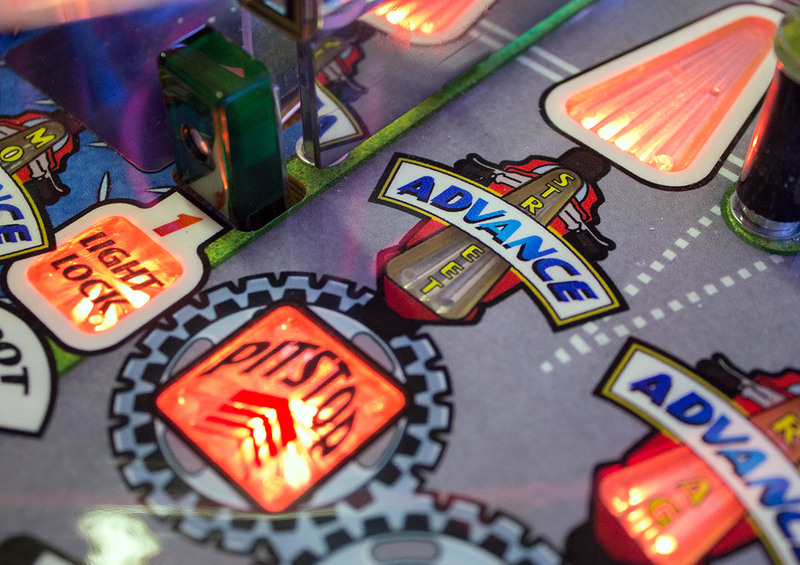 Fearing the worst, we were able to use the diagnostic system to check the status of the printed circuit boards under the playfield, and discovered there was no communications with one of them. 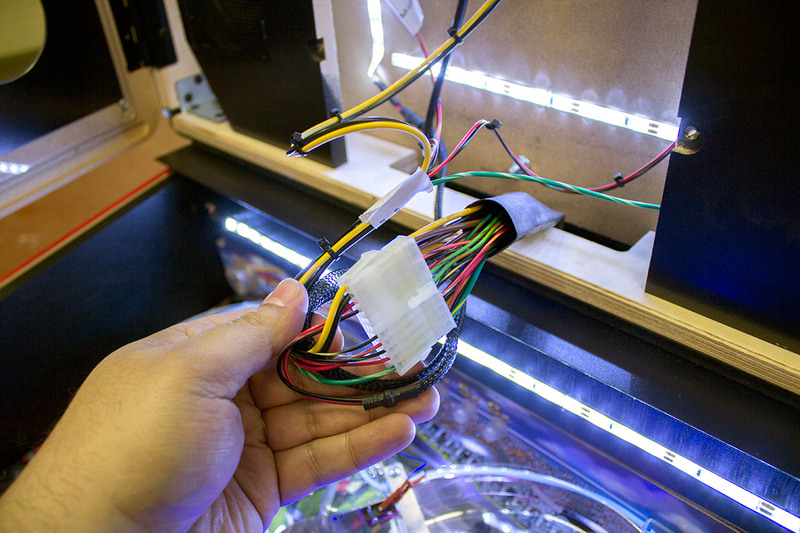 After lifting the playfield we found we had dislodged one of the USB connectors. Once it was plugged back in, the game discovered it correctly and everything worked as normal again. Talking of lifting the playfield, let’s do just that. Three large black PCBs cover much of the underside of the playfield. 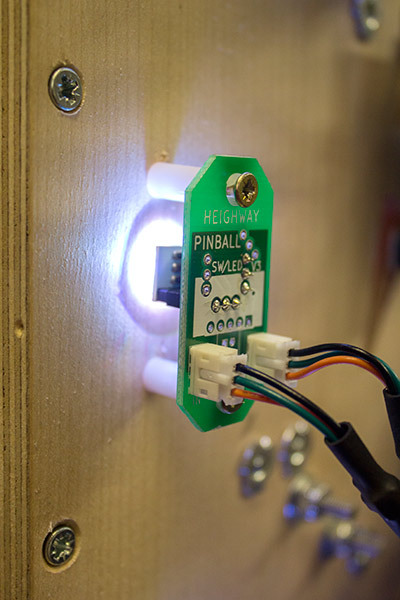 The game’s insert LEDs, general illumination LEDs, and inductive switches are mounted on these, as are the drivers for nearby solenoids, and inputs for physical switches. In some cases it is not practical to extend the large boards into areas filled with mechanical devices, so smaller satellite boards are used instead, and are connected to the large boards to provide extra LEDs and/or switch inputs. 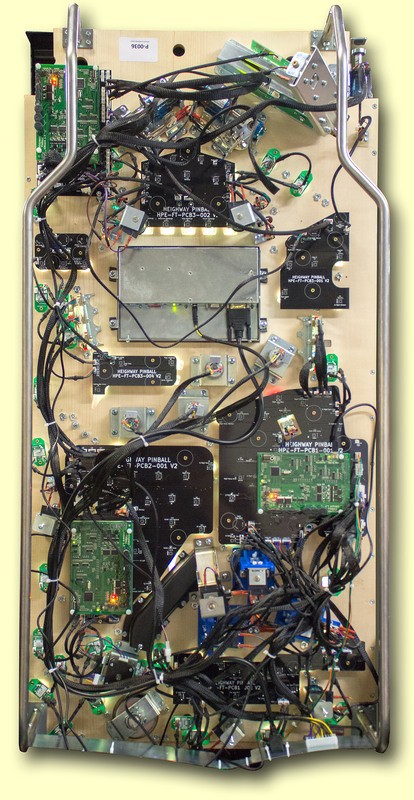 The large boards all have input/output (I/O) boards mounted on them. It is these I/O boards which interface with the PC in the cabinet over a USB cable. 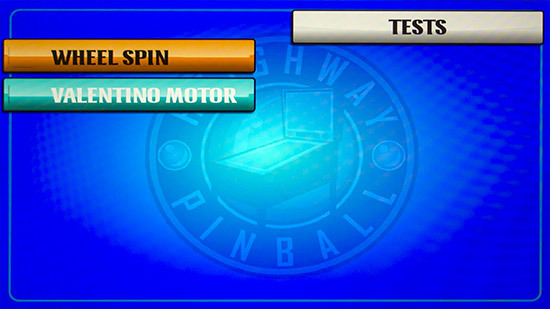 That concludes this In-Depth Review of Heighway Pinball’s Full Throttle. We hope you enjoyed it and found out some new information about the game. It’s certainly interesting to compare it to, and contrast it with, how other manufacturers build their games. Full Throttle uses Heighway Pinball’s Gamechange System, and so certain design decisions – such as the cabinet and backbox construction, and the flipper button, launch button and start button plates – have been taken with this in mind. 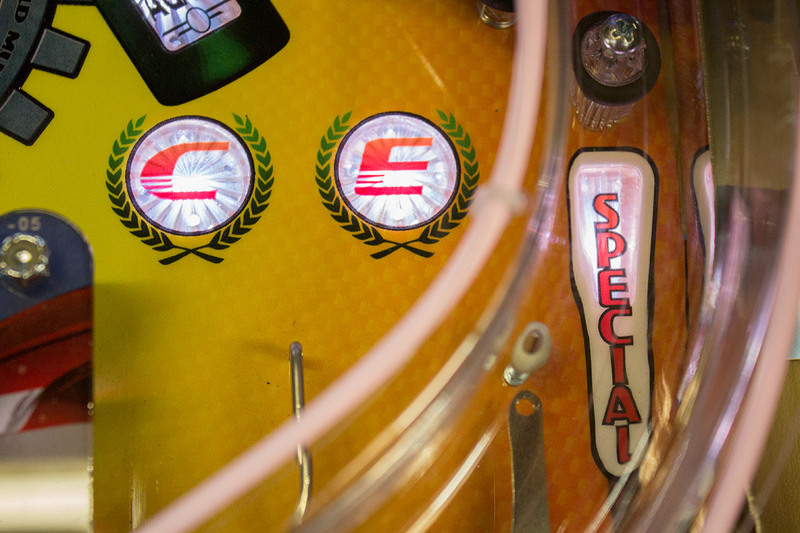 They add cost compared to just applying a decal or drilling a hole in the wood, but provide longevity and options for future game controllers. The game’s rules are challenging, with some interesting strategic decisions needed to maximise scoring. They’re not massively deep, but getting through to the wizard modes is difficult enough, while still appearing to be almost with reach. We haven’t covered the rules in too much depth because Bowen Kerins made a very nice tutorial for PAPA which covers all the key points, and which you can watch below. Thanks to Heighway Pinball for giving us full access to one of their games for this review, and also for the chance to play the prototype of their second game, Alien. More on that later, of course. So what do you think about Full Throttle? Is it a game you would consider buying? 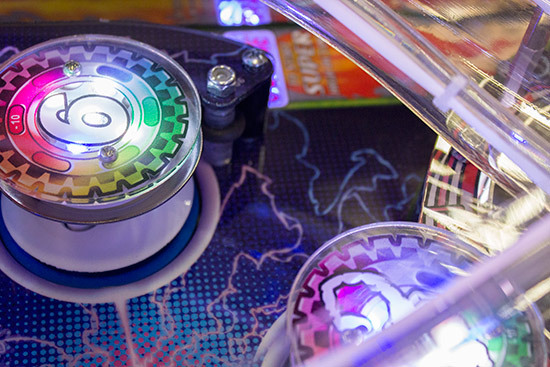 Have you played one, and what did you think? 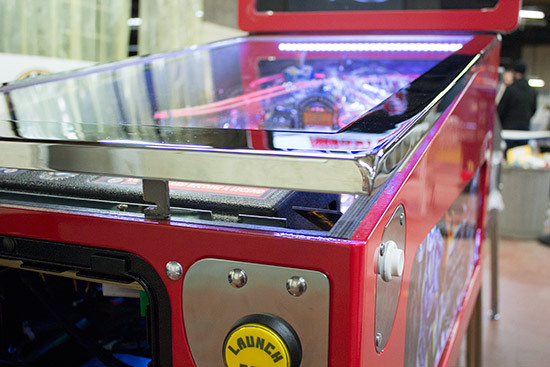 What do you think of the game’s special features such as the dual monitors, the playfield monitor, the removable mechanisms, the game change system, and the different cabinet and backbox designs? Great looking game ! And a really great in depth article! Awesome. Very solid hardware, quality quality and nothing but quality. Great game to play.Fast and some very special loop shots to the left return lane. As a old motorcyclist stil no theme for me, well i don’t like no fear also. 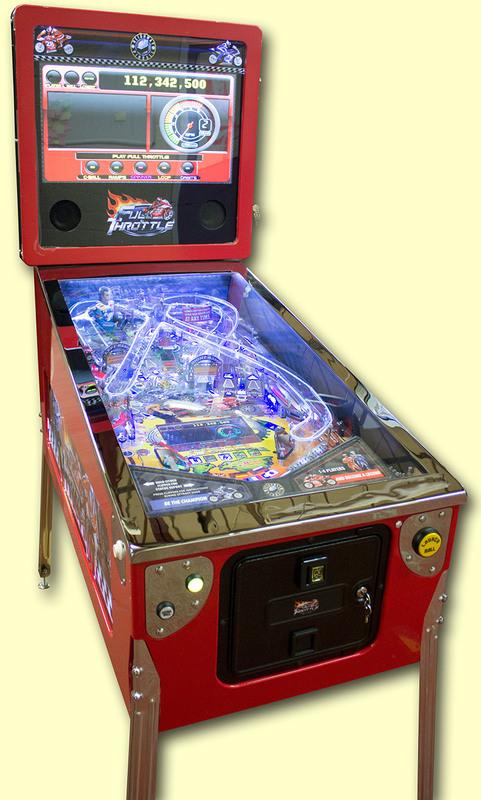 But as a pinball player still a decent game to collect and play. 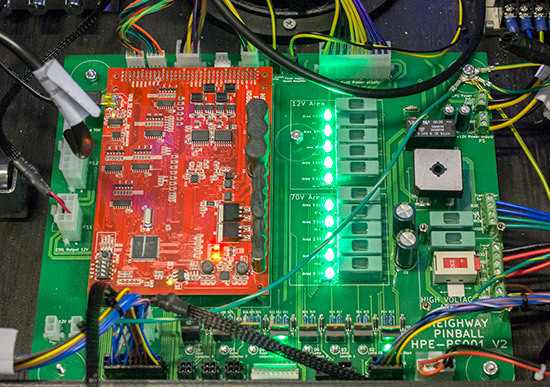 Harry showed me both machine’s programing diverence on the dutch dpo 2015 and the hardware. Lot of bang for the bucks if you now wat i mean. Wow the le looks great, chroom trim and glossy red cabinet and big display. Excellent writeup Martin. i’ve really enjoyed playing this game (FTh … FuTh … what’s the acronym gonna be, as FT is taken?) since i first saw the prototypes back in 2014. it’s fast, it’s flashy, it’s flowy, it’s fully loaded. what an entrance for a new manufacturer, well done Andy H! the last time i played FTh, i was overwhelmed by all the coloured shots, and had no idea what i was supposed to be doing – but that just made me want to have another go, and another go, and another go ….. which is surely what makes a game popular to both players and operators. 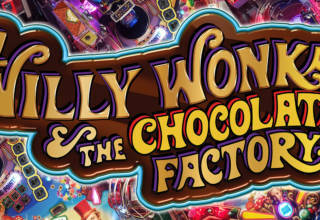 so i’m looking forward to seeing these out on location, and i promise to buy several credits on it whenever i see it. This game is awesome and fast! 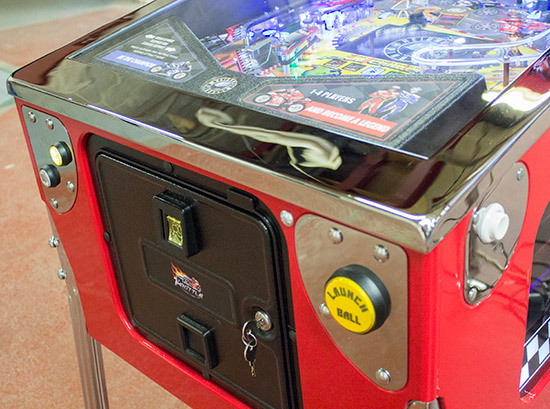 The functionality of the cabinet/game design is amazing! I would love to add this game to my collection, especially with the release of Alien not too far away. To be able to swap games so easily would be so great. 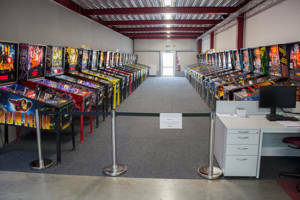 My husband and I played this at a local arcade and had a blast with it! We played it for quite a while, because it was so much fun. My husband even walked away with the #1 high score! 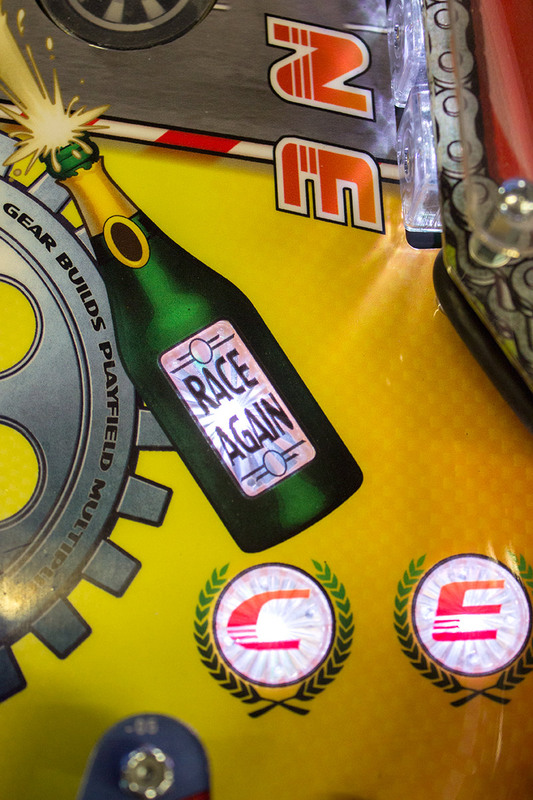 The race modes in the game are especially fun. I can’t wait to play it again!